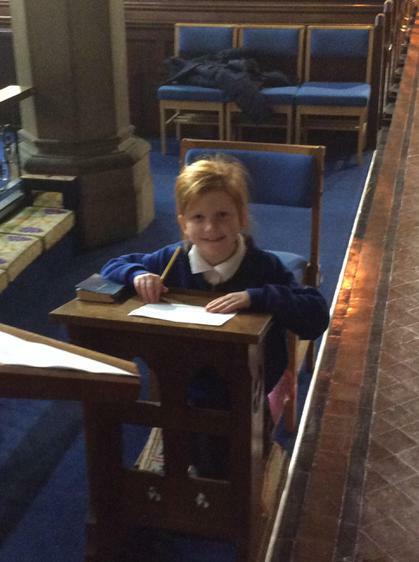 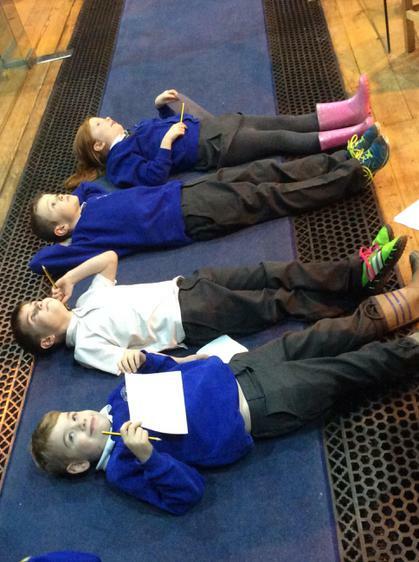 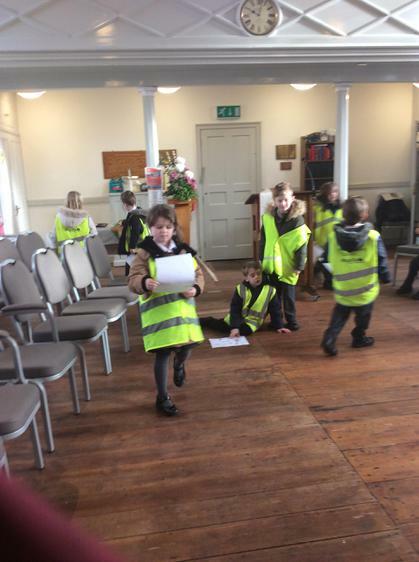 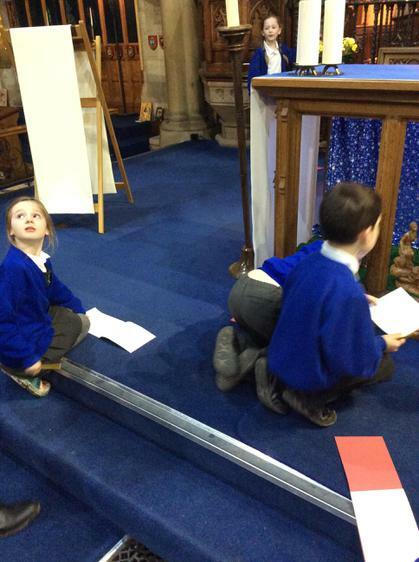 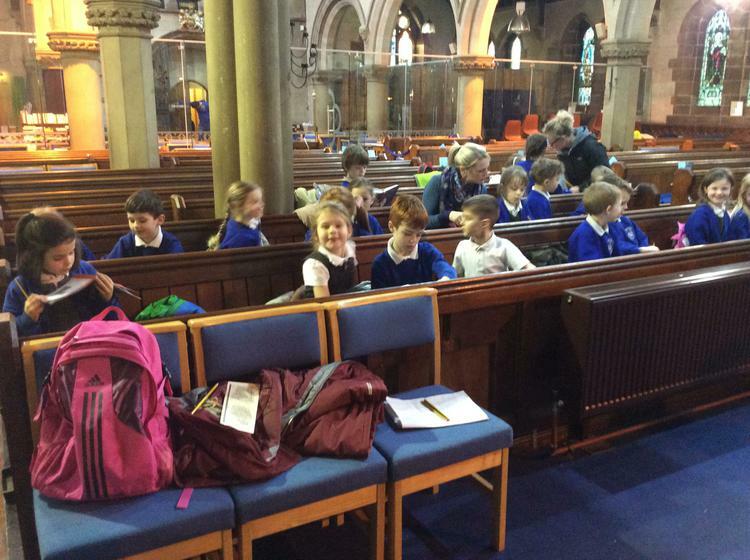 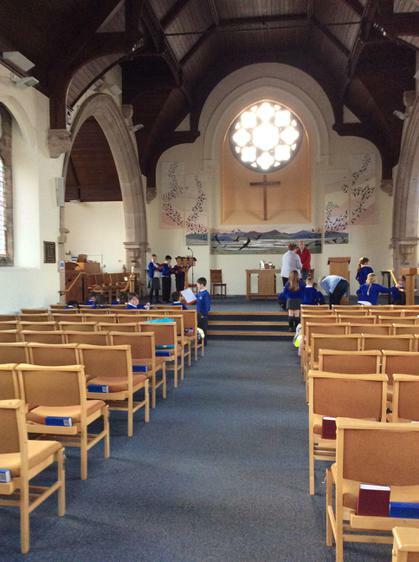 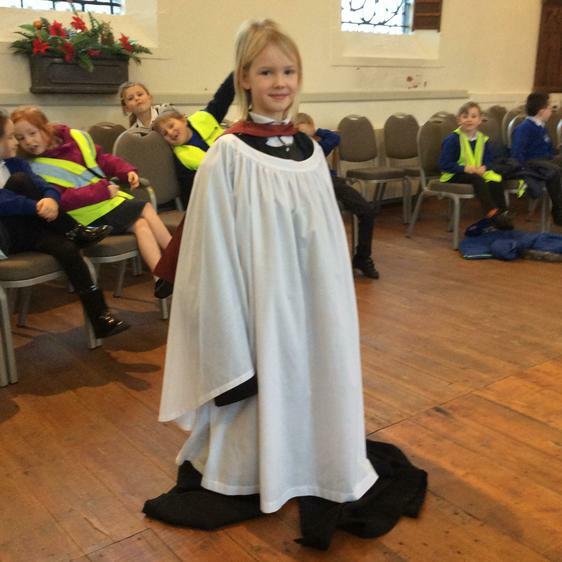 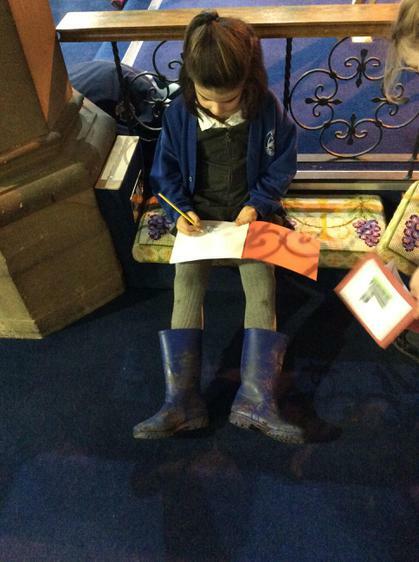 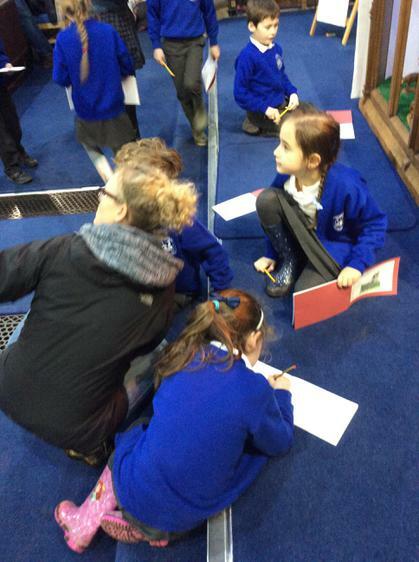 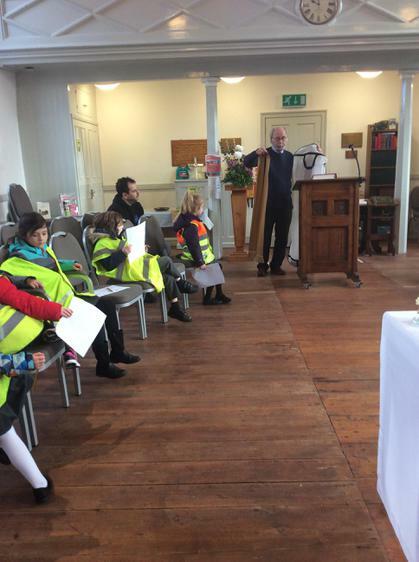 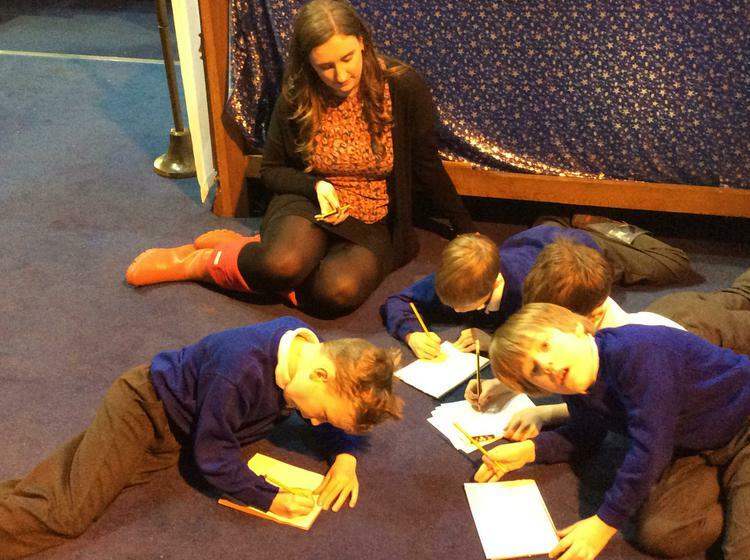 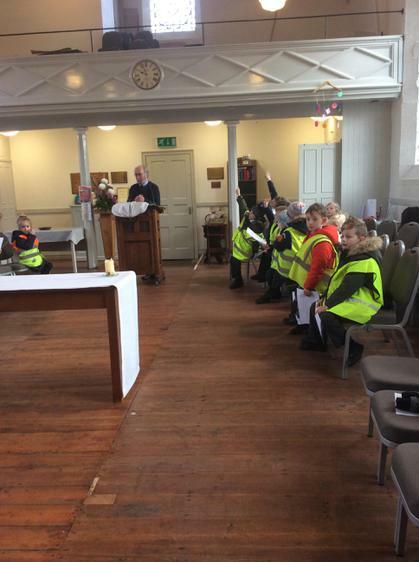 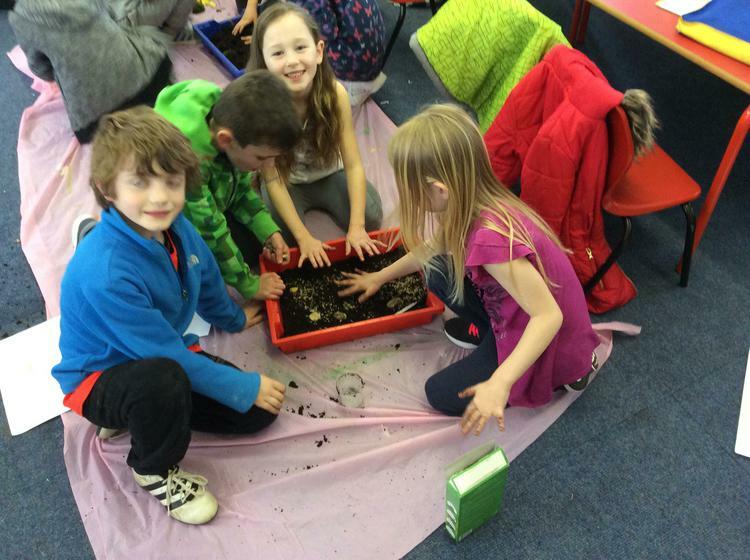 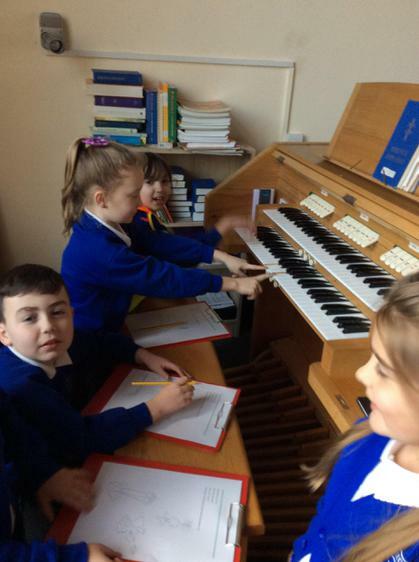 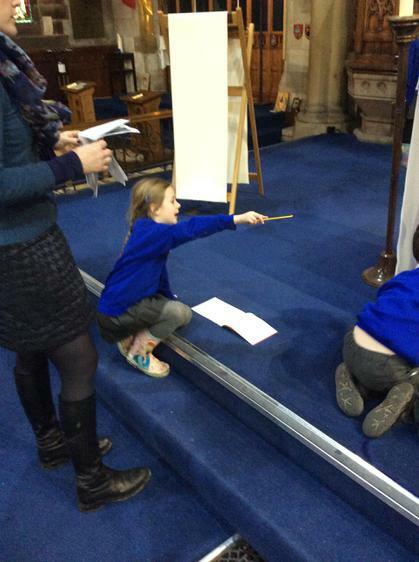 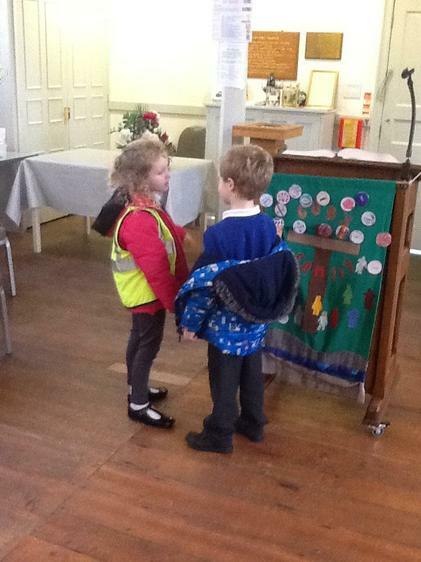 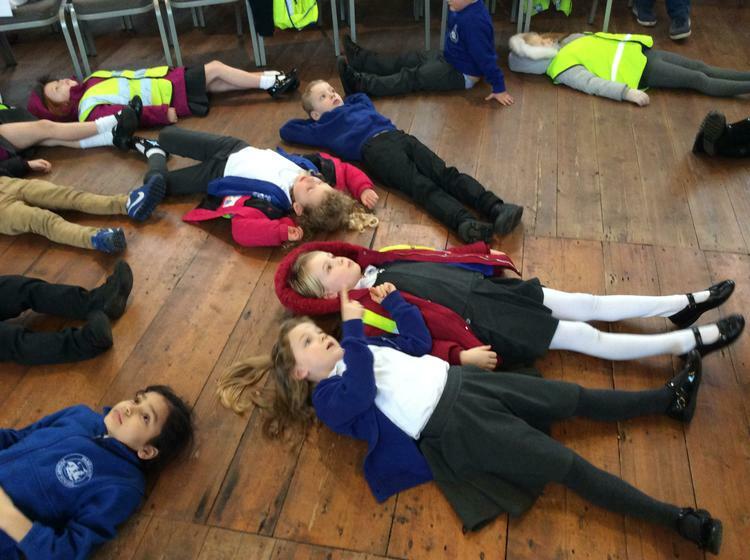 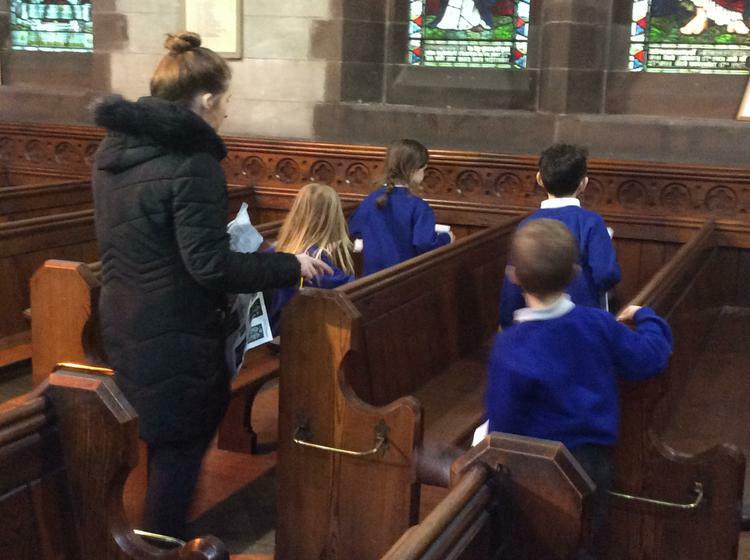 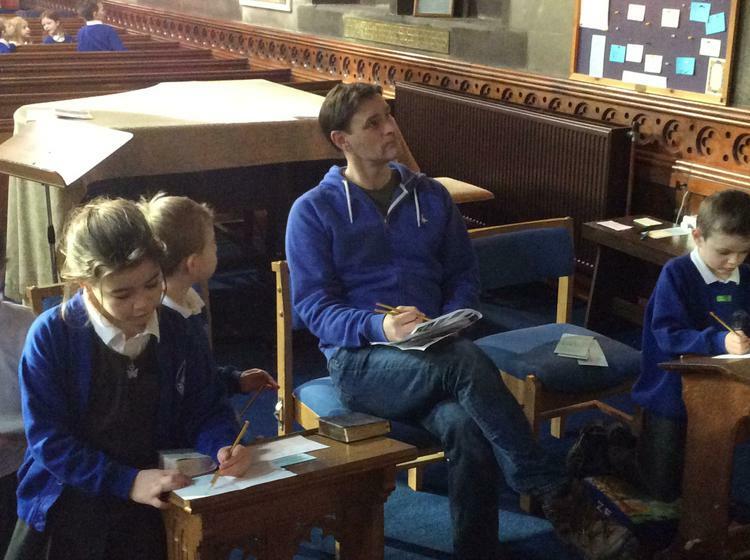 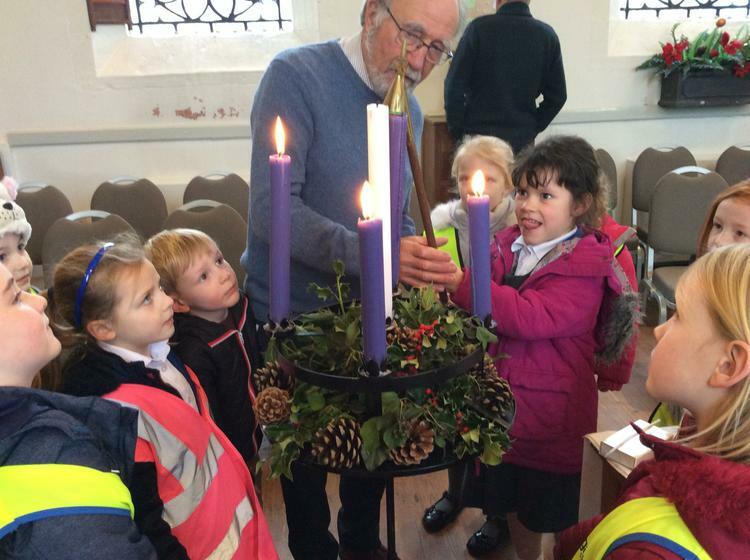 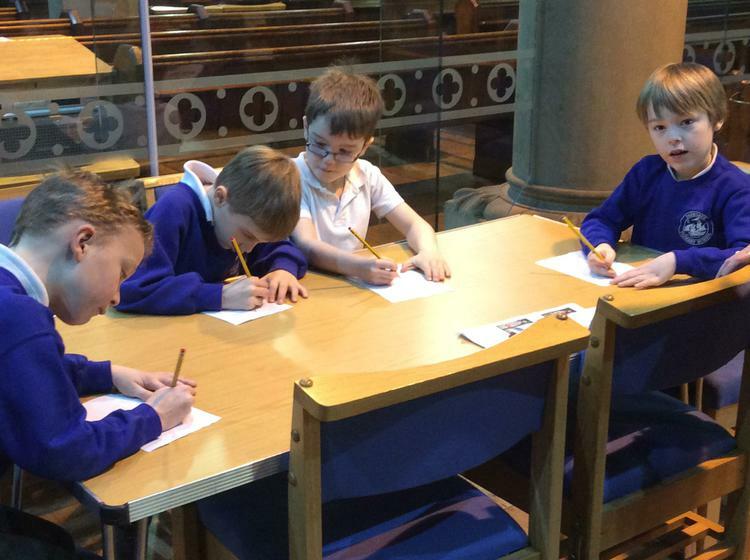 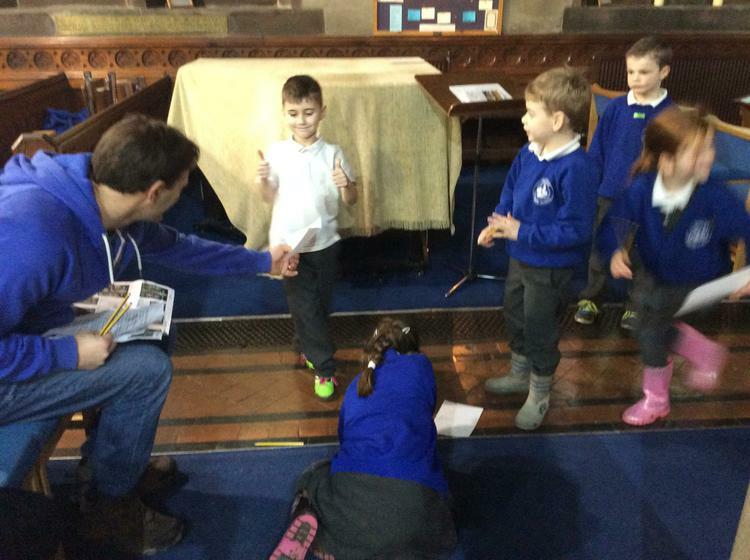 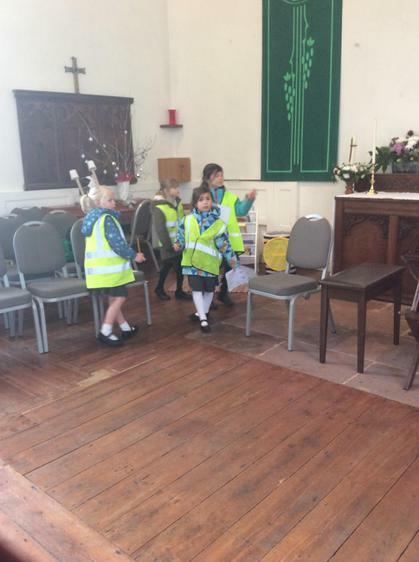 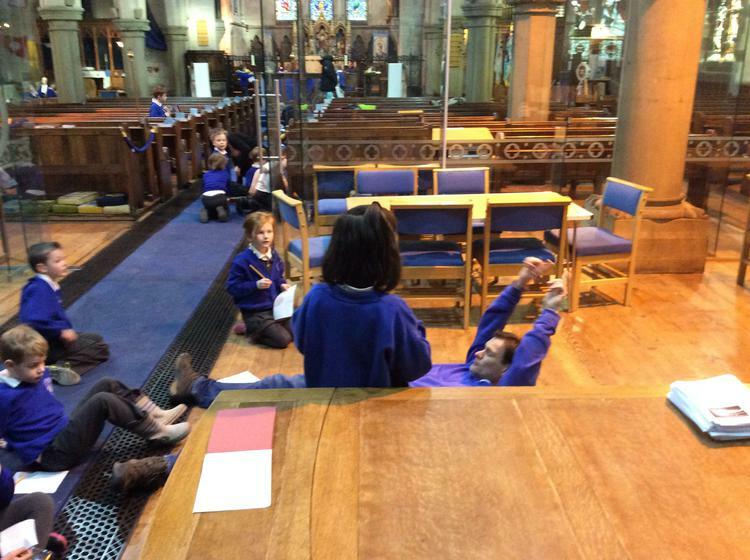 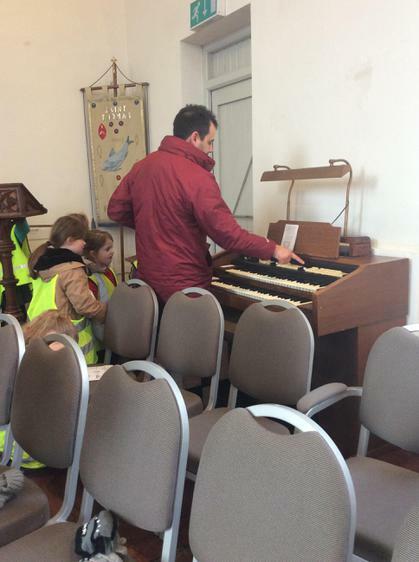 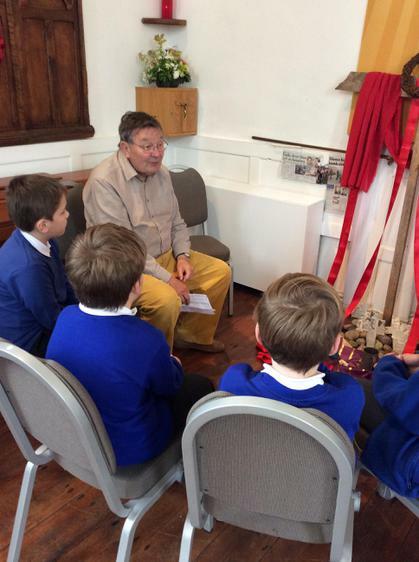 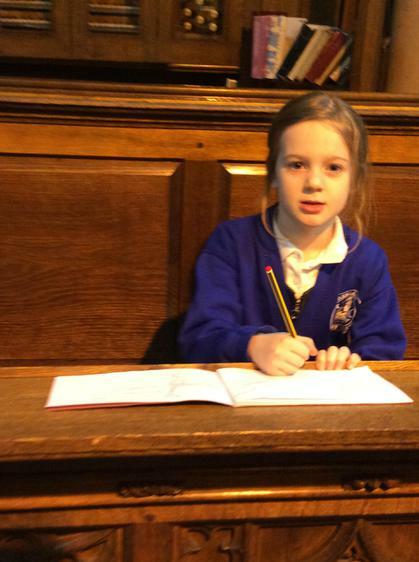 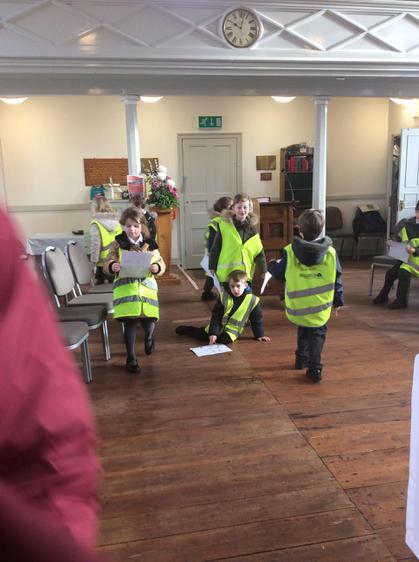 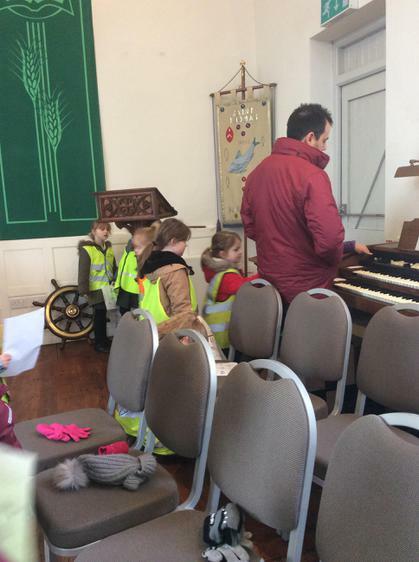 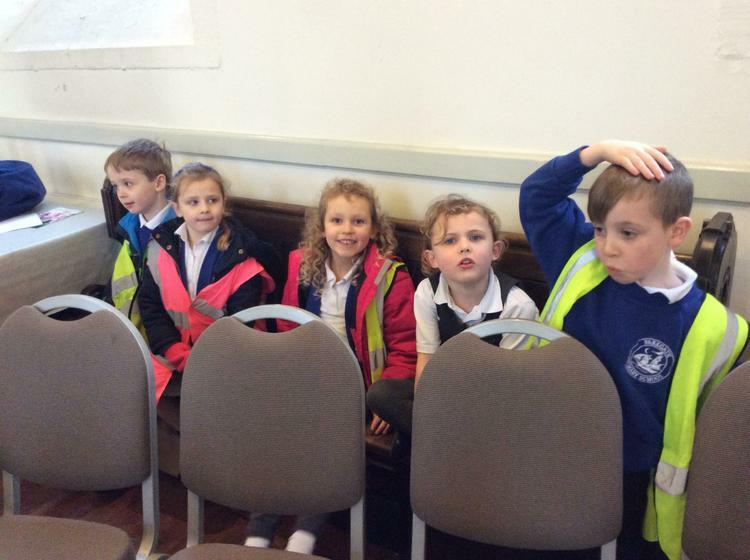 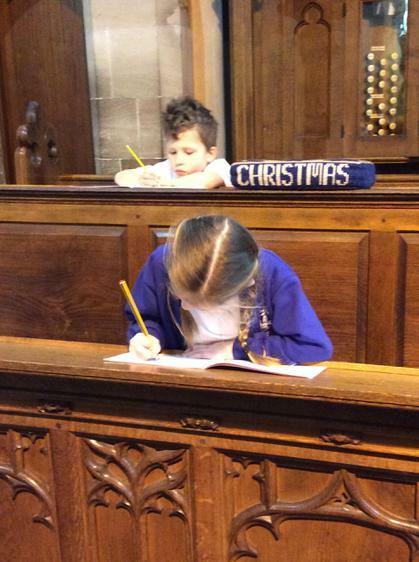 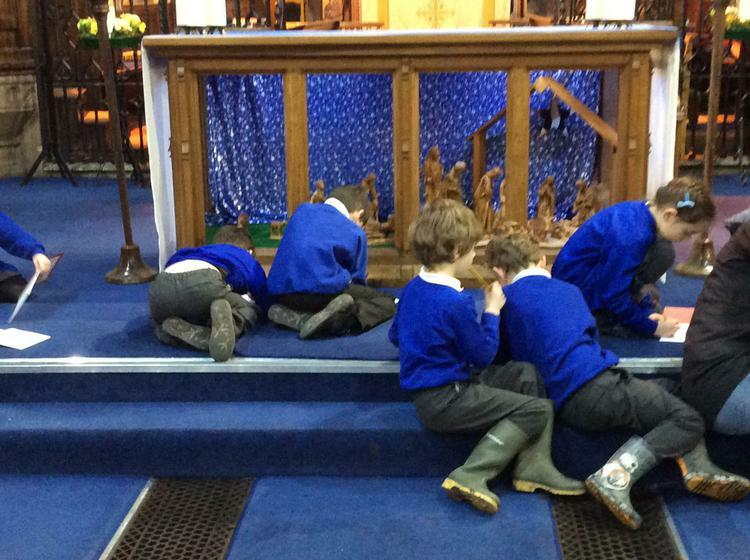 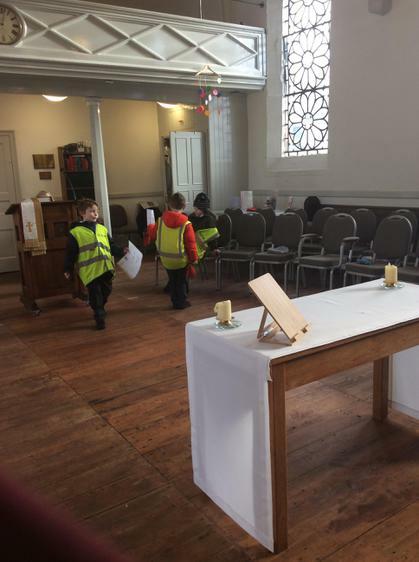 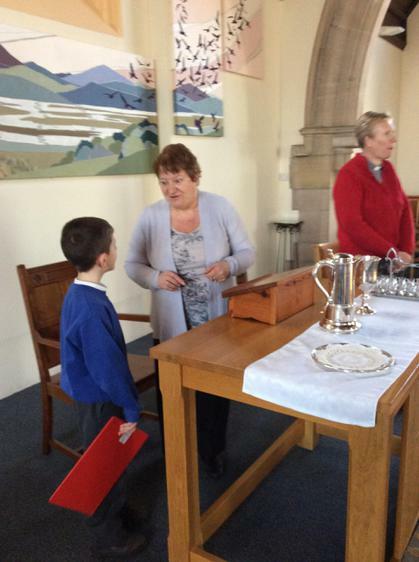 year 1 visited st Thomas' church as part of their community topic. 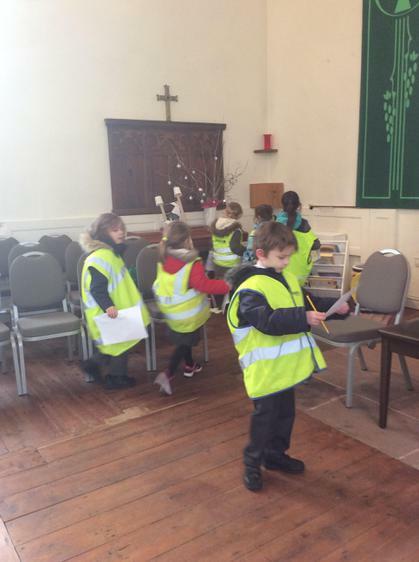 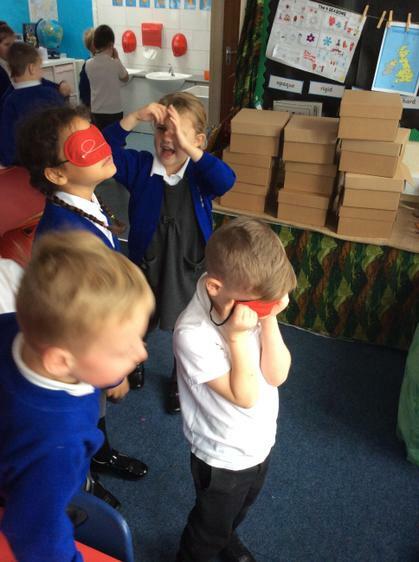 They used their senses to explore the church. 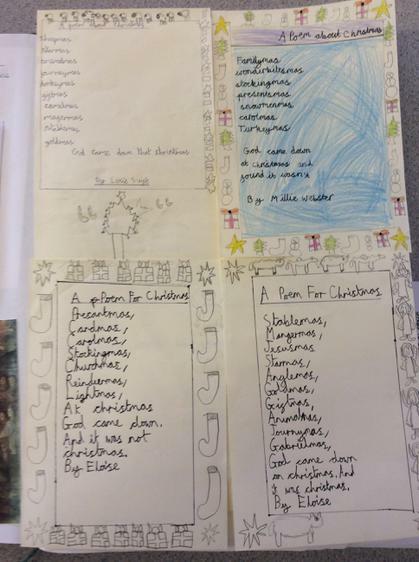 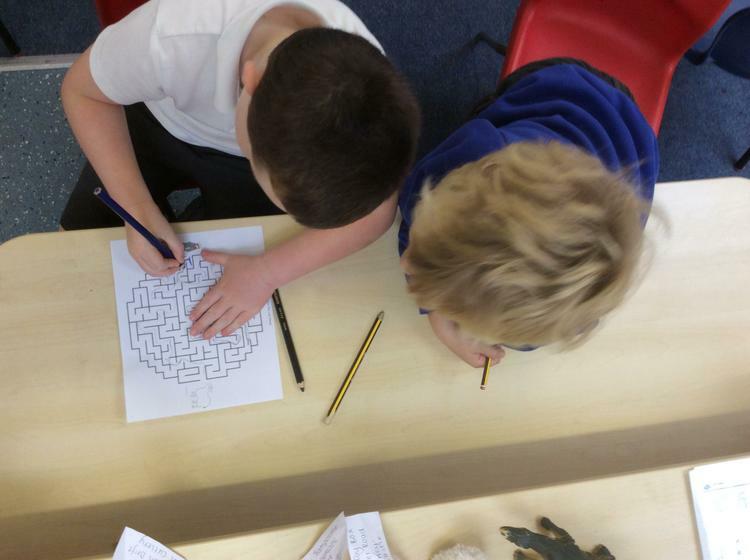 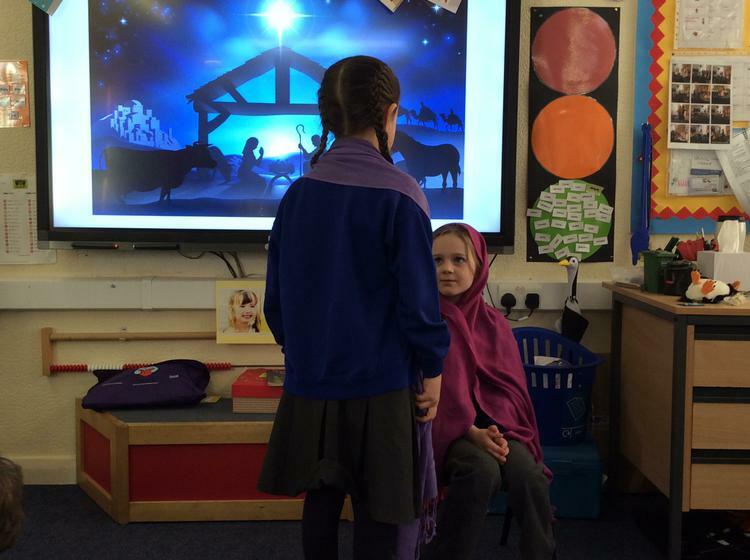 Tigers have been busy exploring stories of Love and Forgiveness.They looked at parables and the Christmas stories. 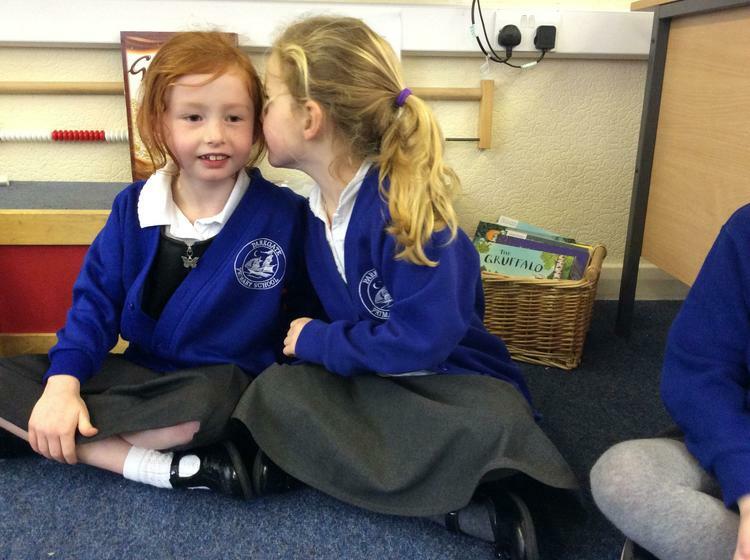 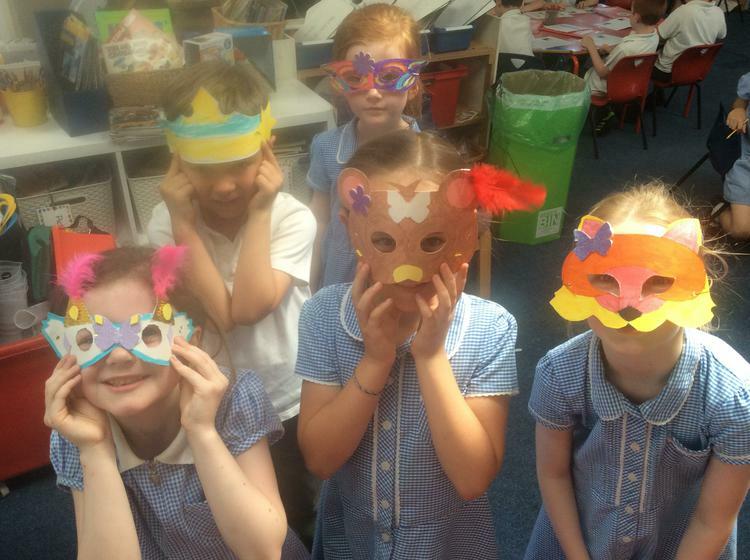 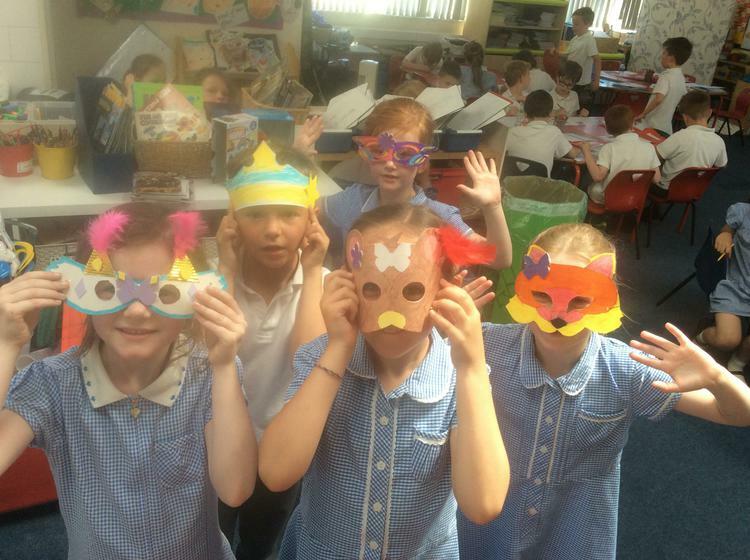 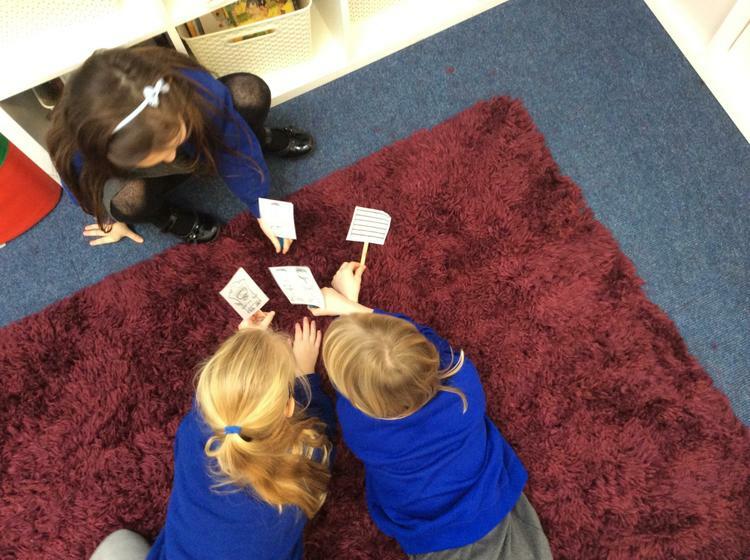 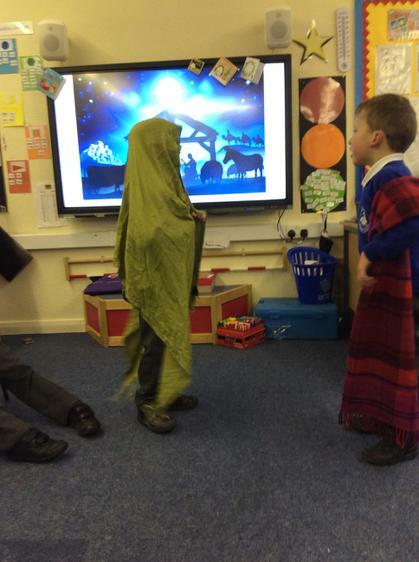 They used drama, puppets, mazes, Chinese Whispers to help them to understand and retell the stories. 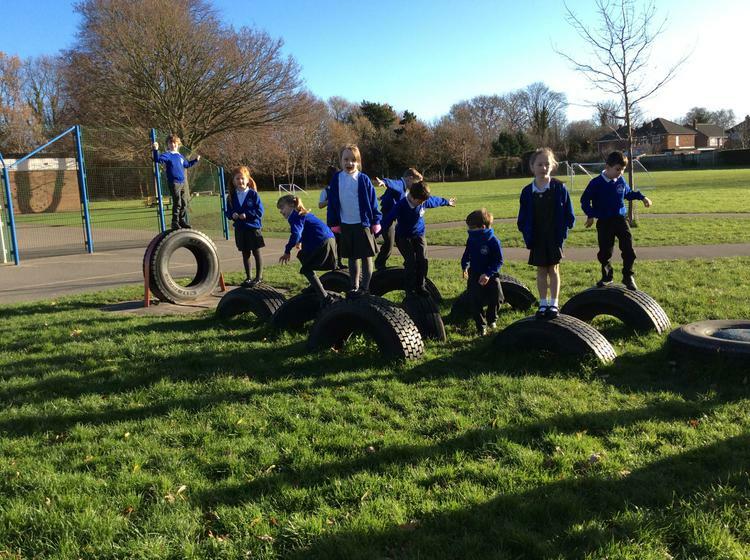 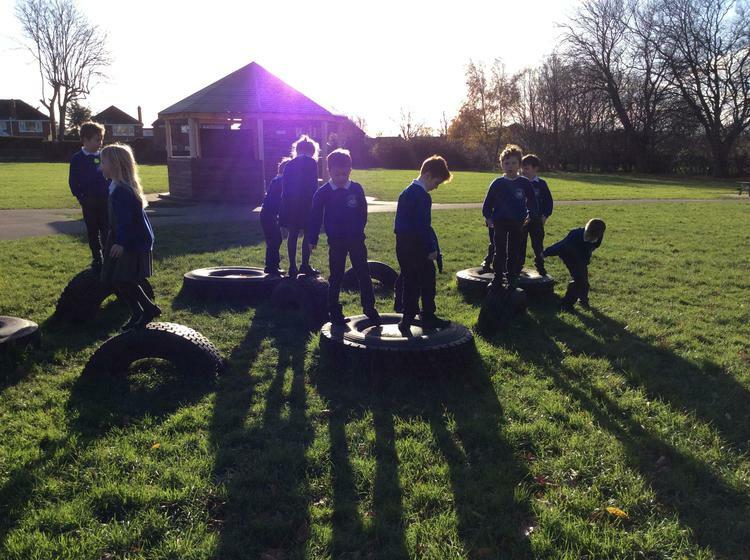 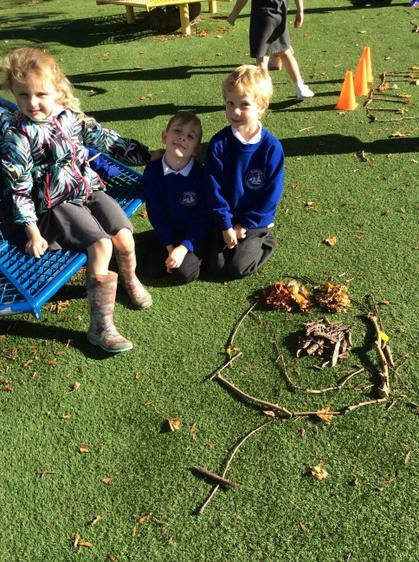 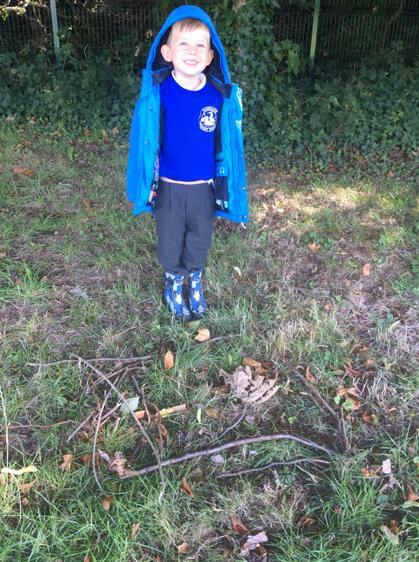 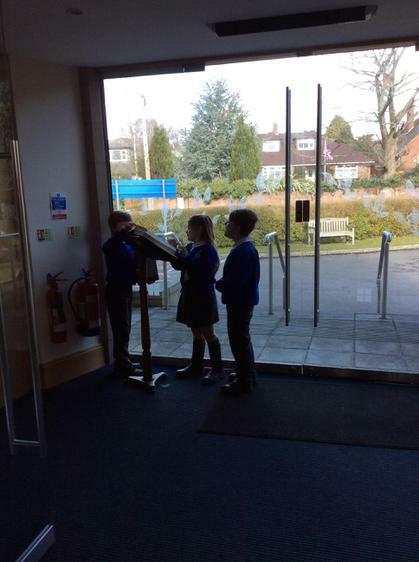 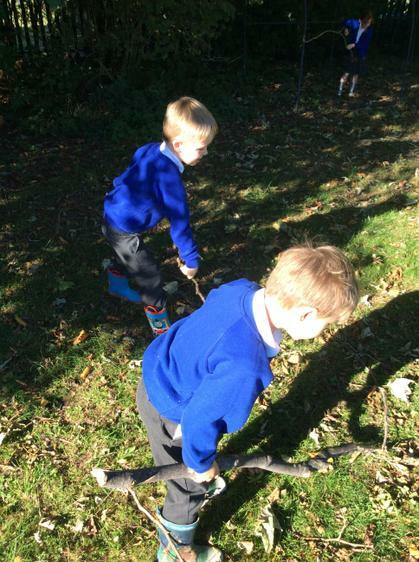 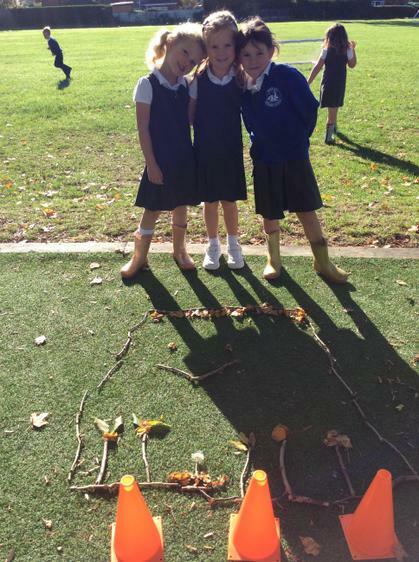 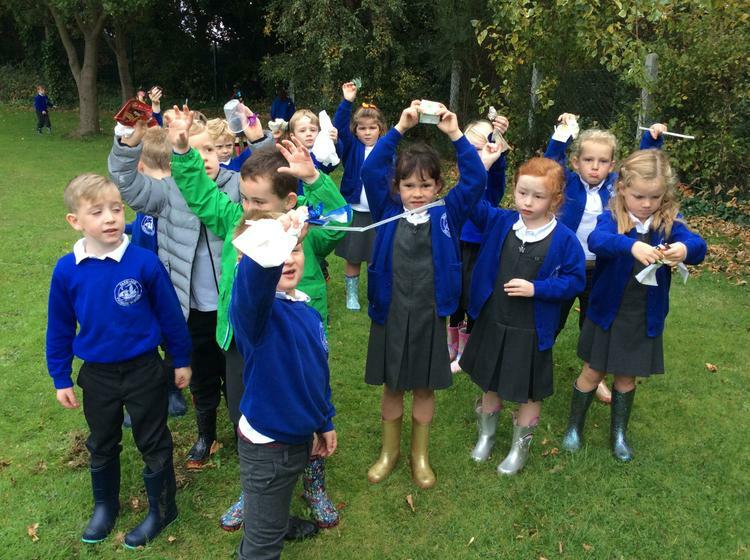 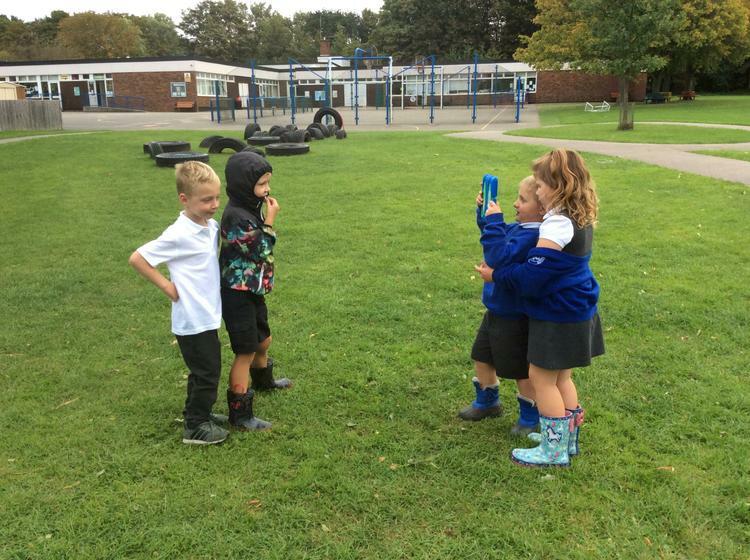 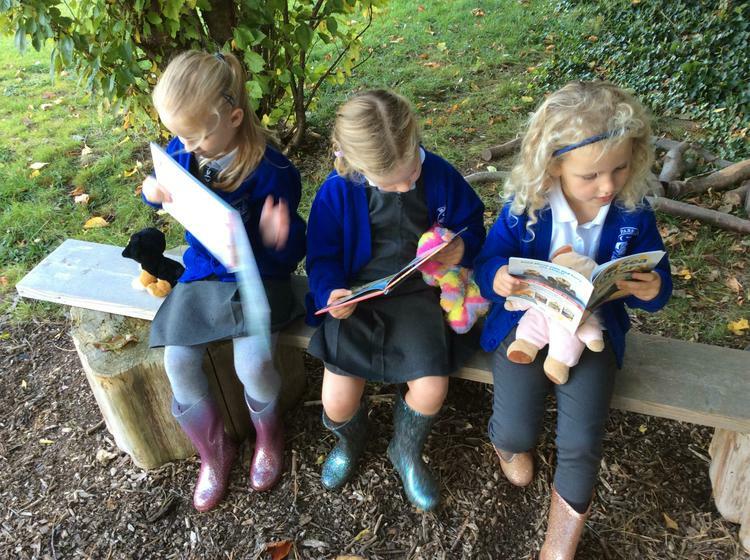 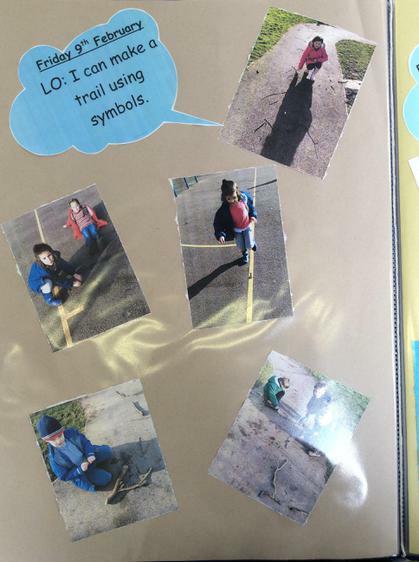 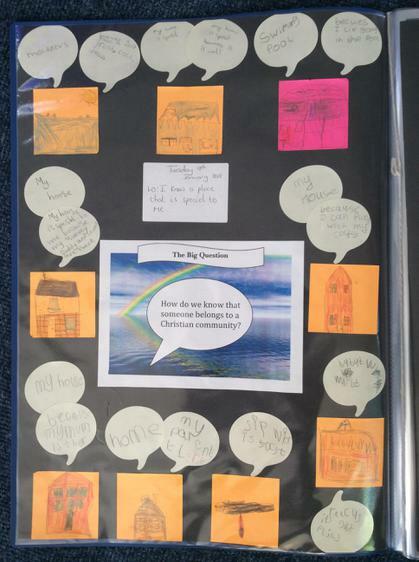 Year 1 have been using our outside area to explore their Big Question about creation. 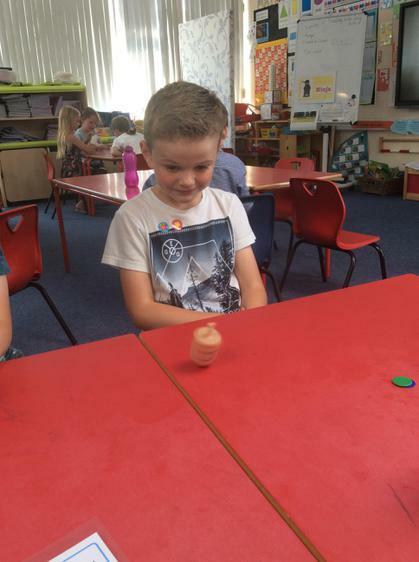 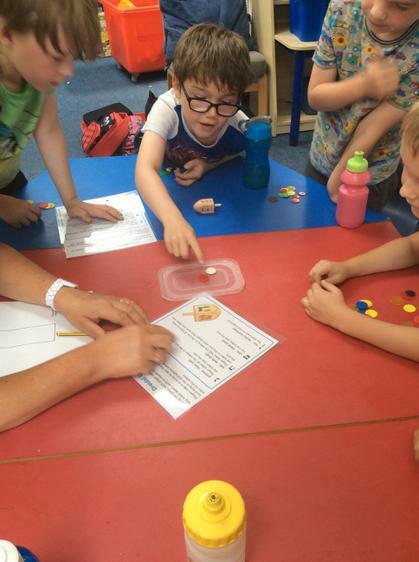 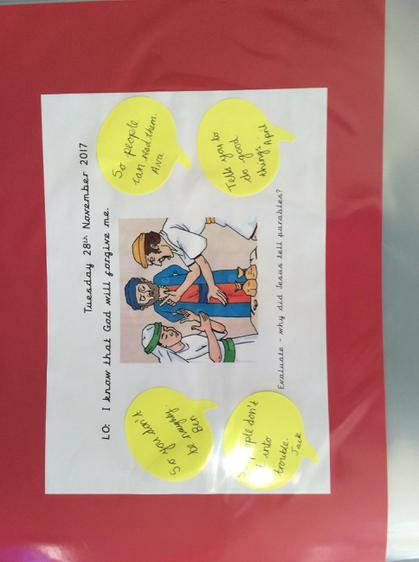 To help the children understand Hanukkah, Year 2 decided how they felt when there were only 8 sweets to share for the fastest 8 runner...then we played the Dreidel game - they loved it and understood why Jewish people celebrated. 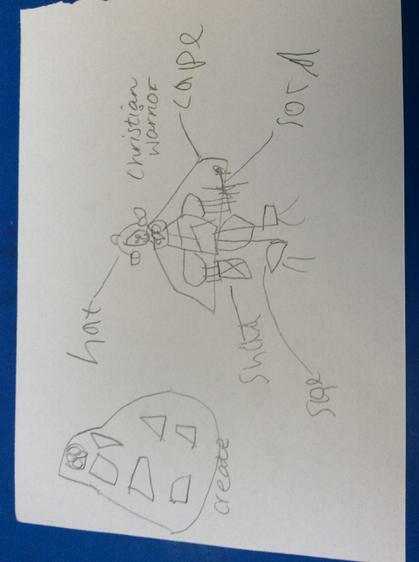 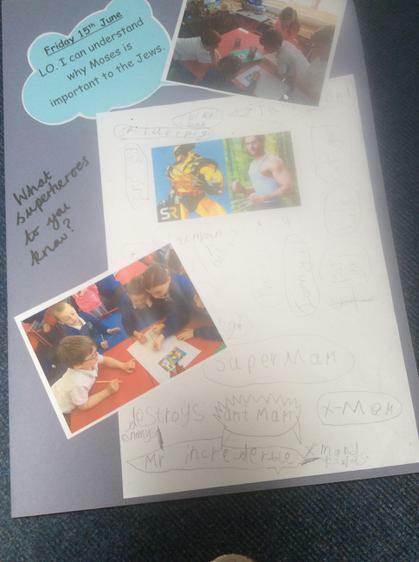 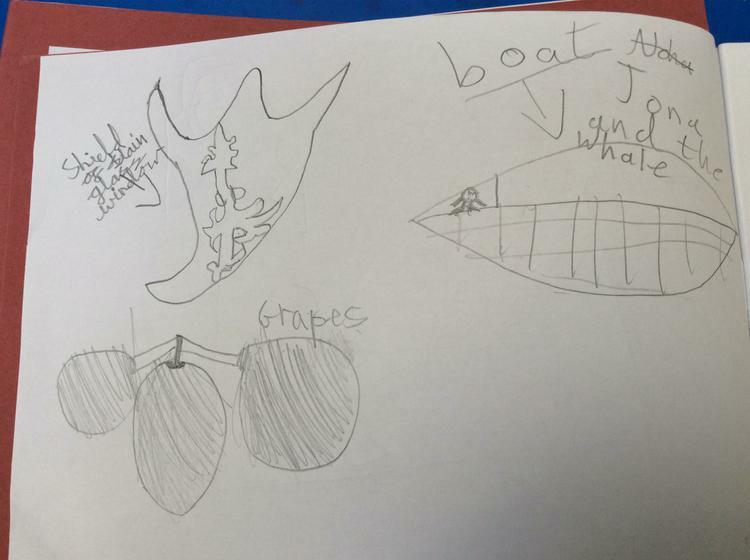 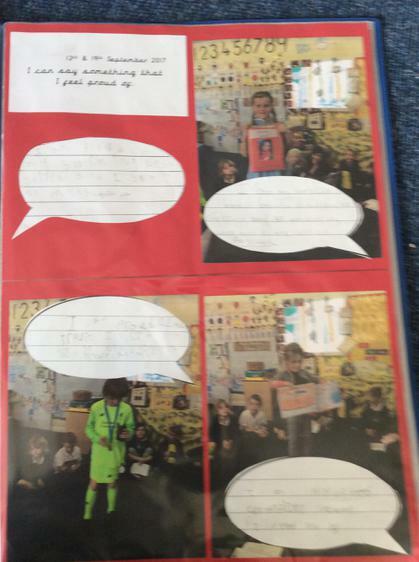 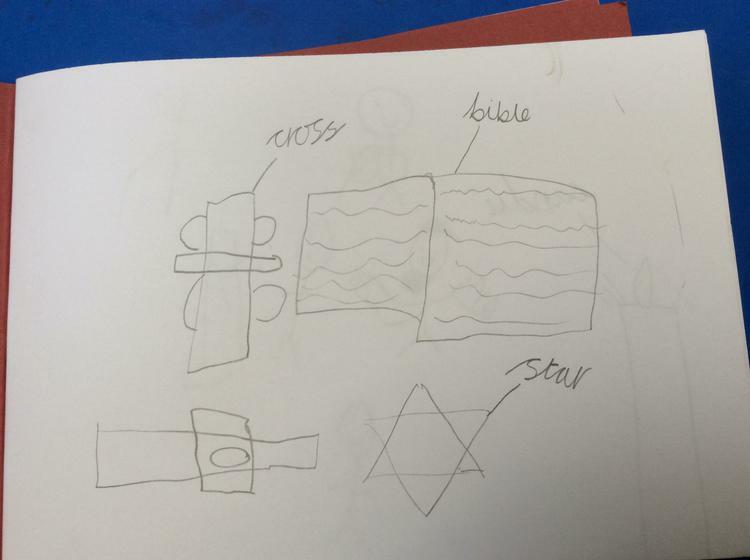 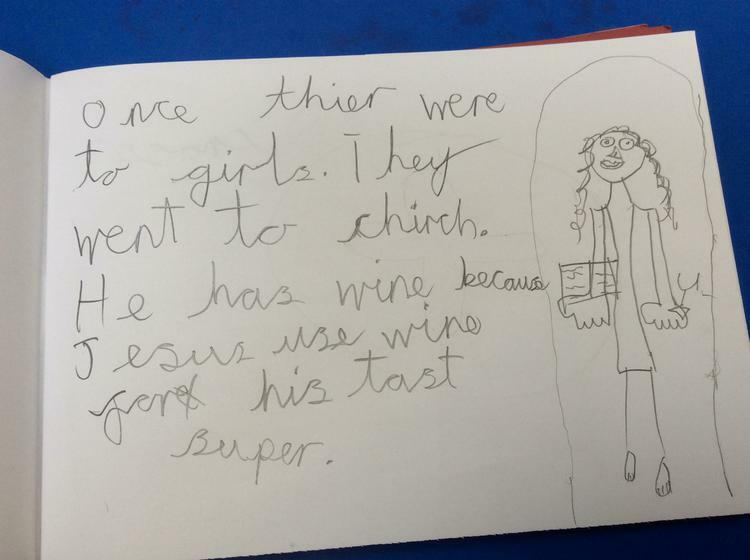 Year 2 have been investigating Judaism through Superheroes! 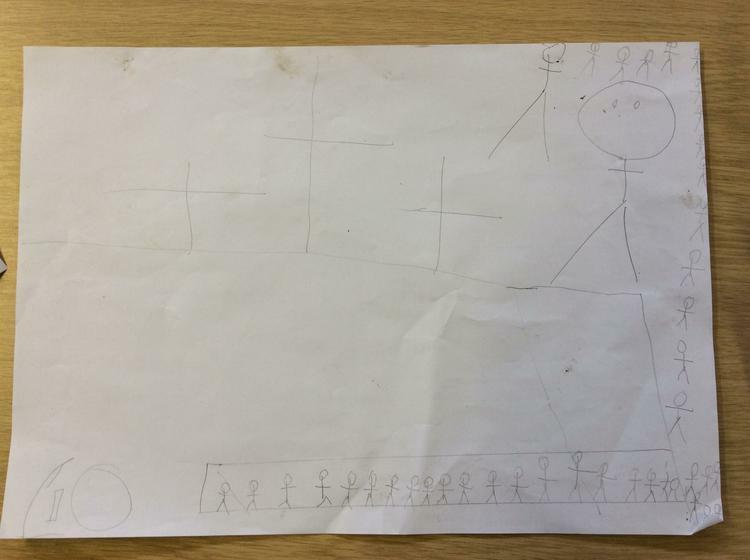 They looked at Moses, Abraham and Esther. 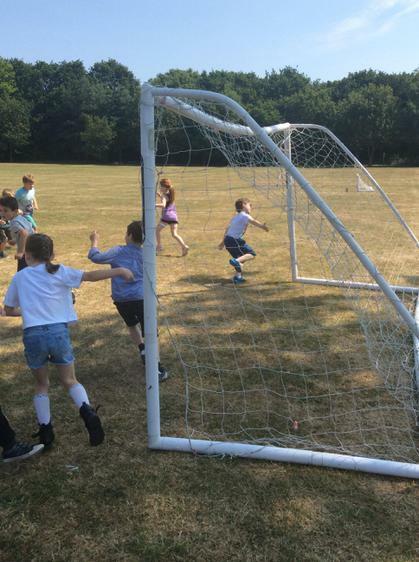 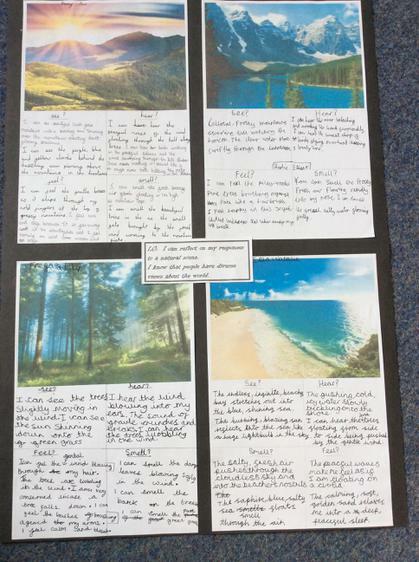 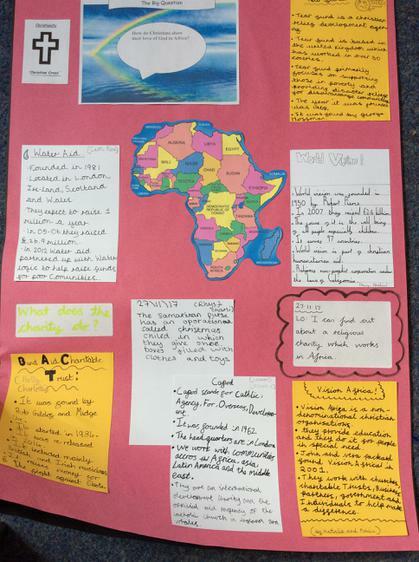 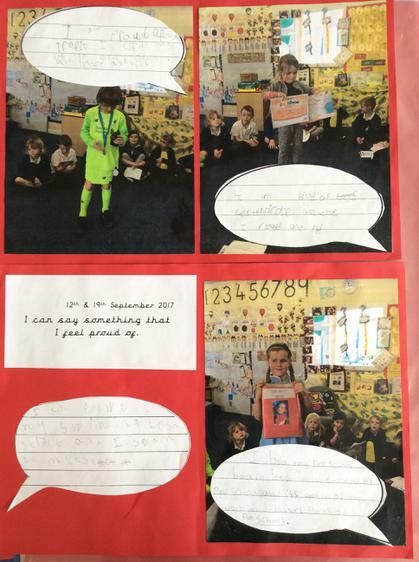 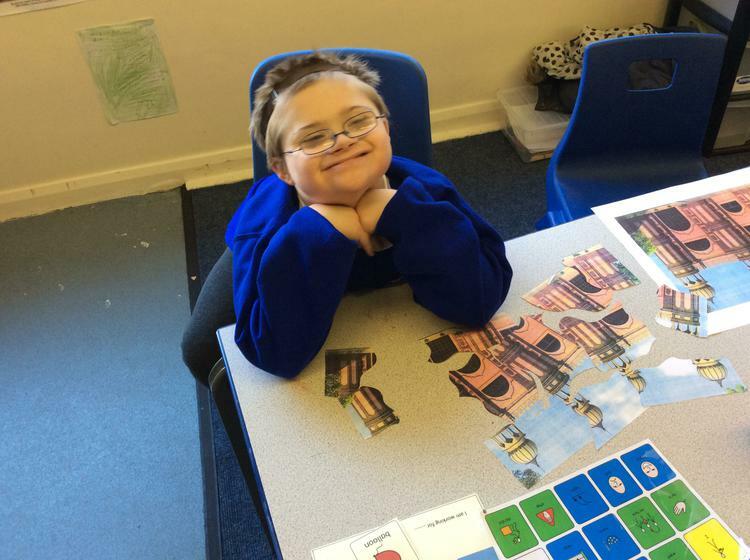 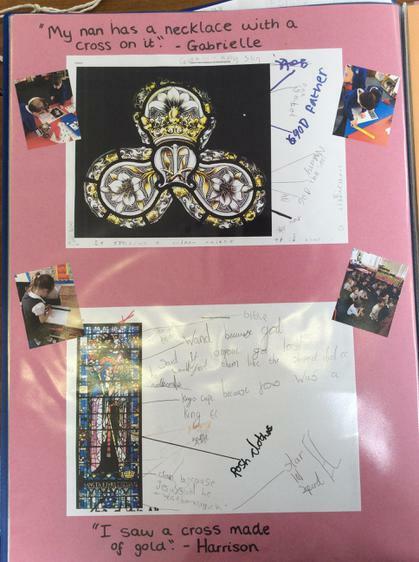 SMSC - These photographs show you how we ensure that SMSC (Spiritual, Moral, Social and Cultural education) are developed through RE. 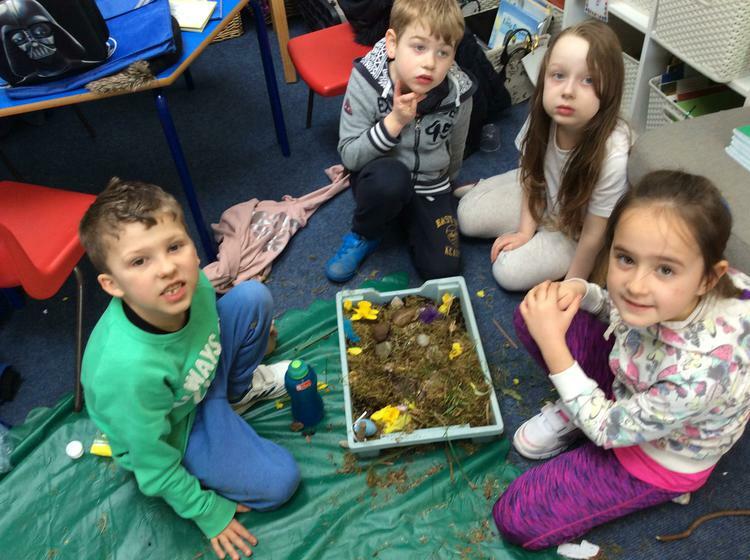 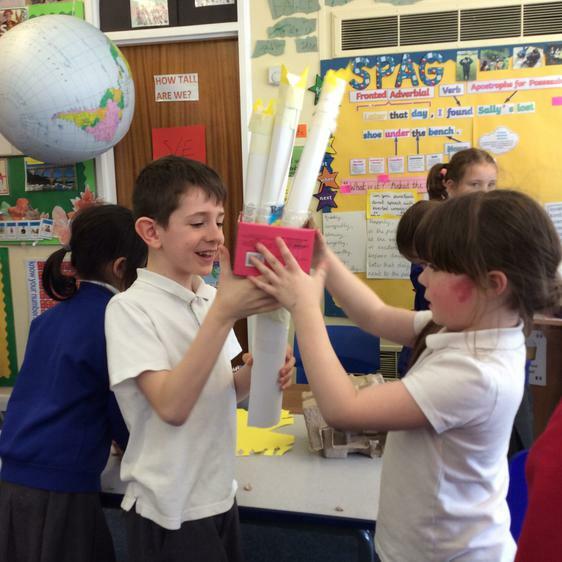 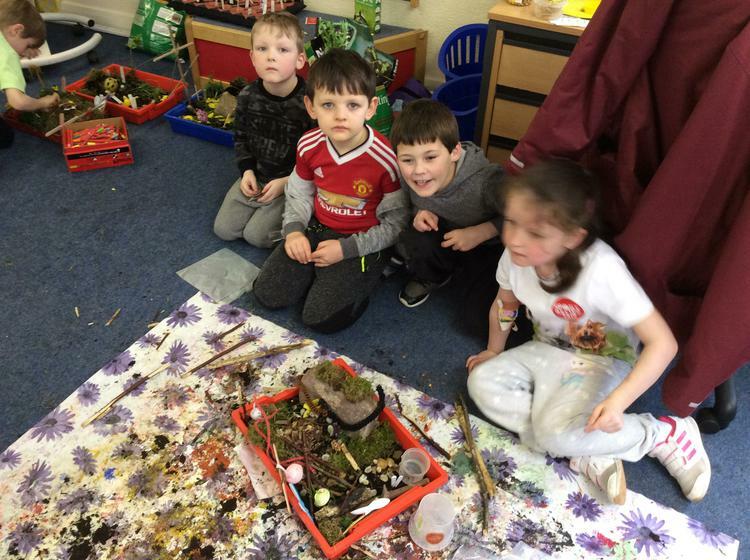 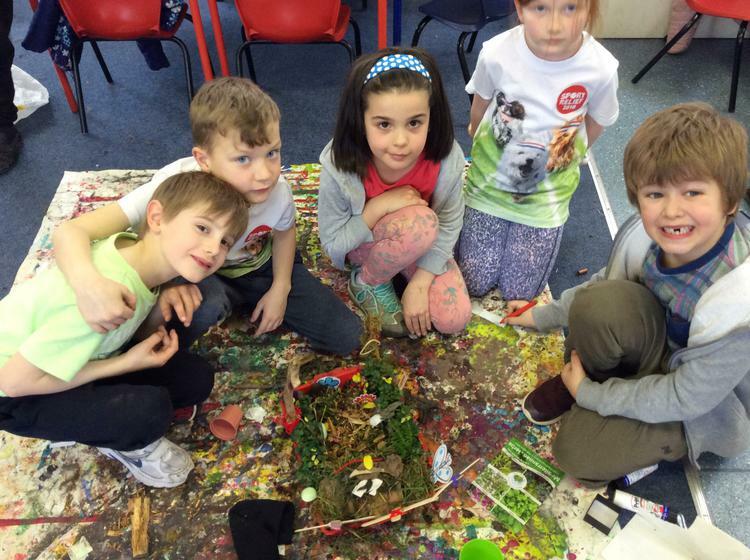 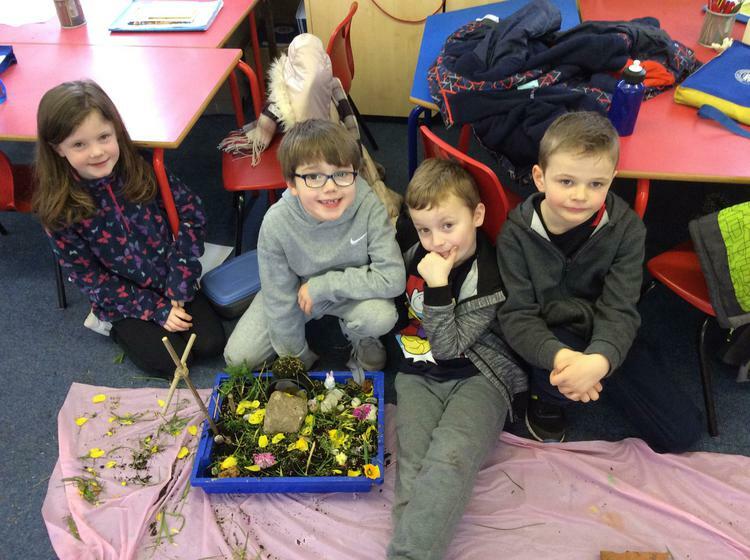 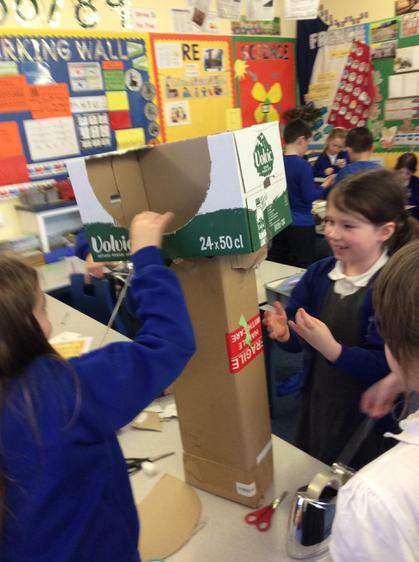 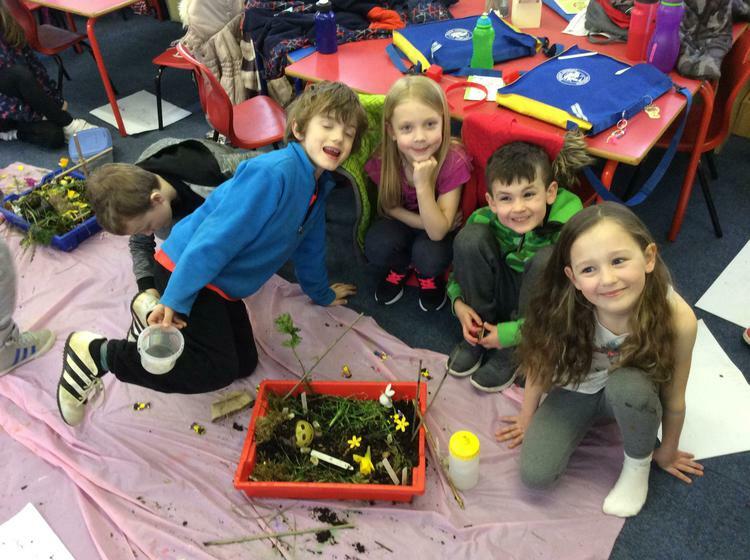 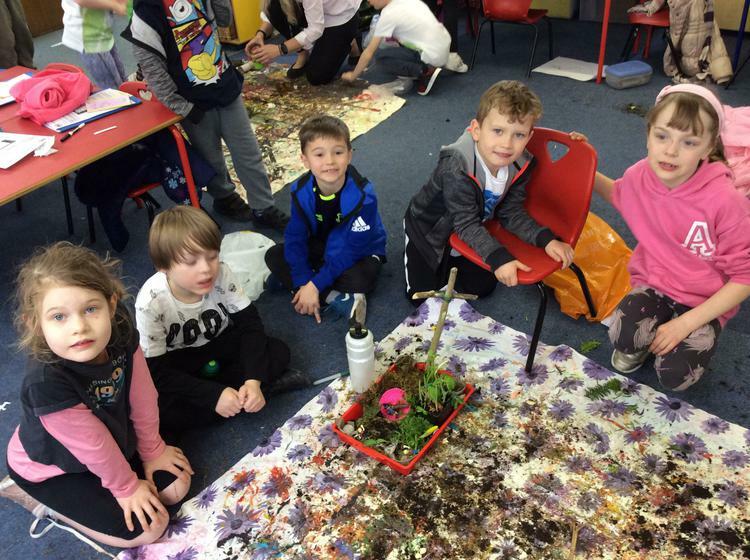 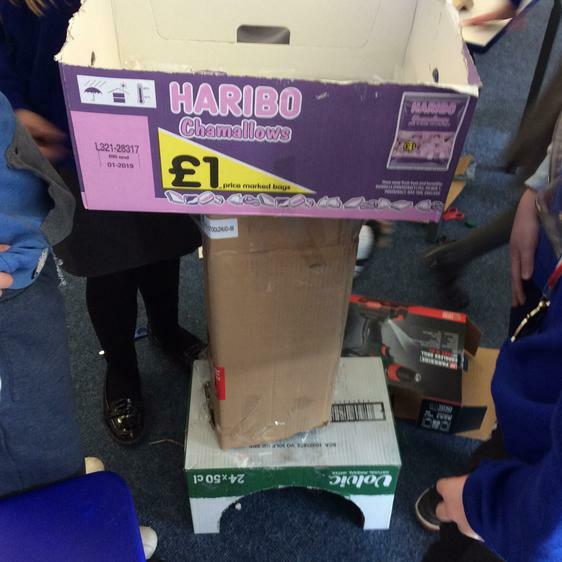 to answer their Big question penguins built easter gardens. 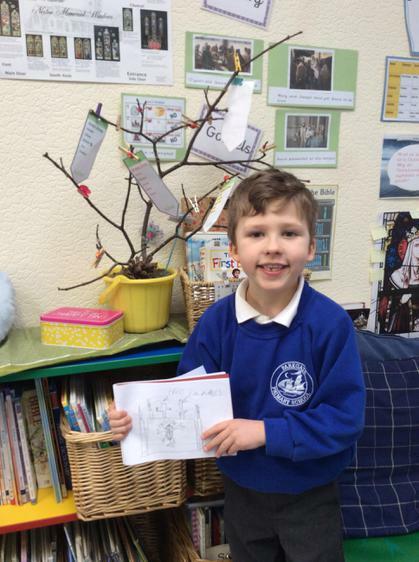 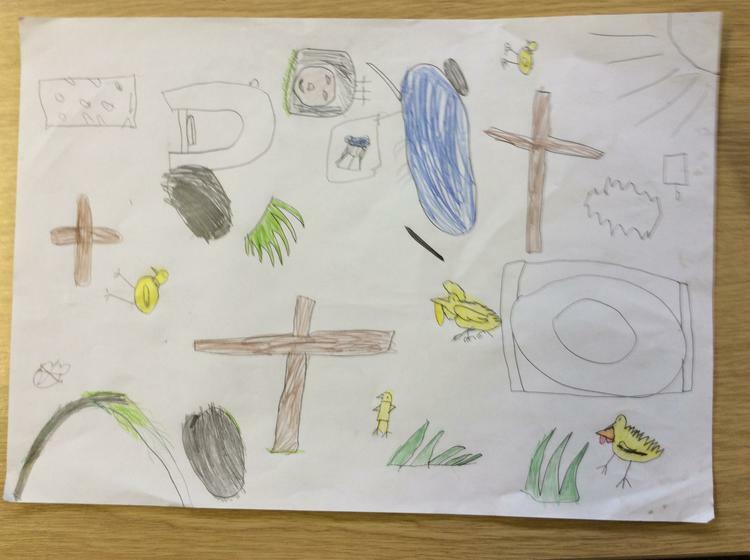 They explained why the artefacts they chose represented easter. 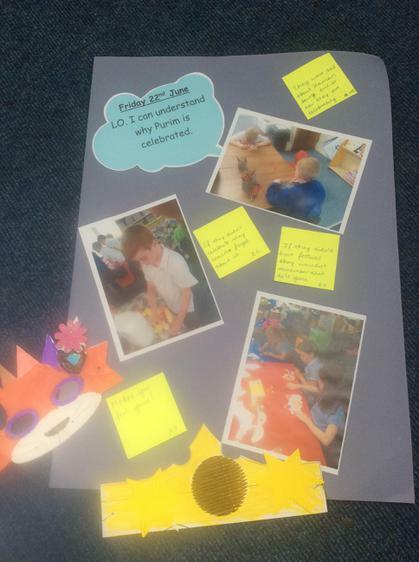 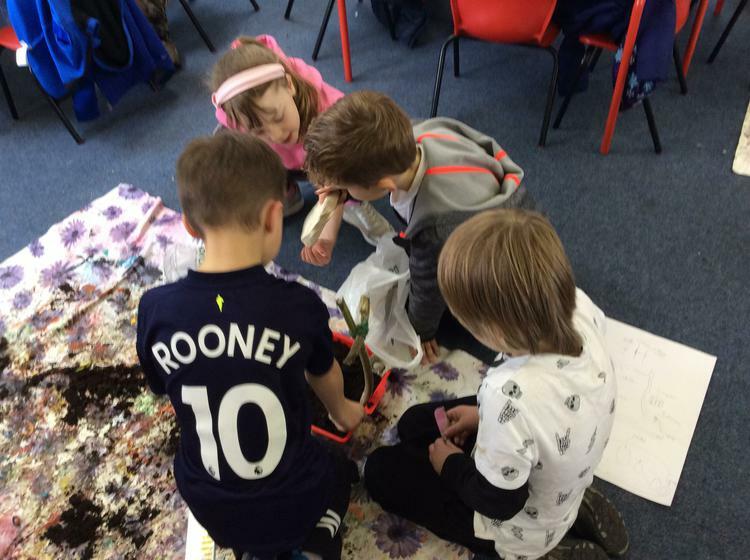 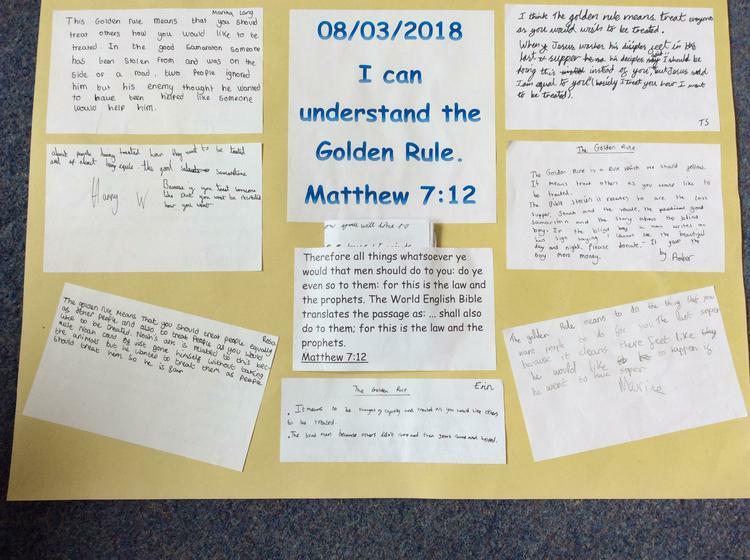 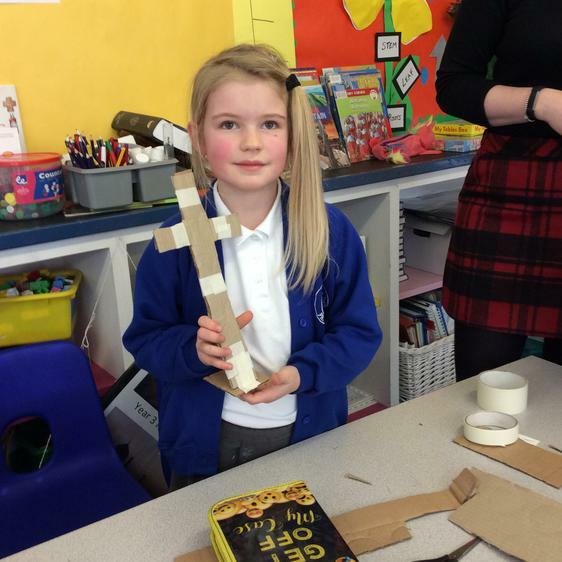 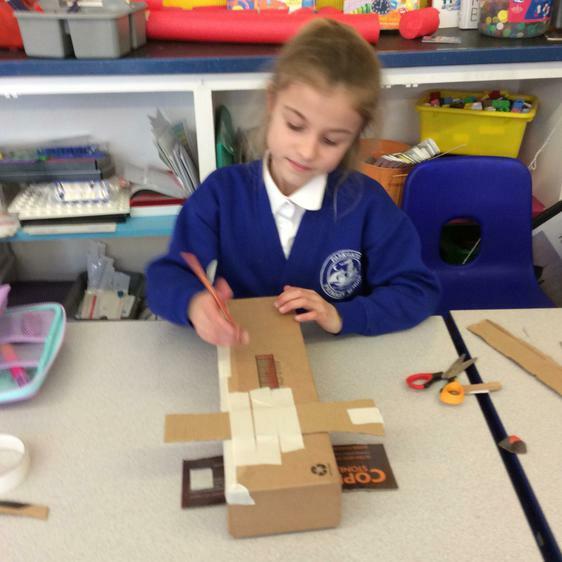 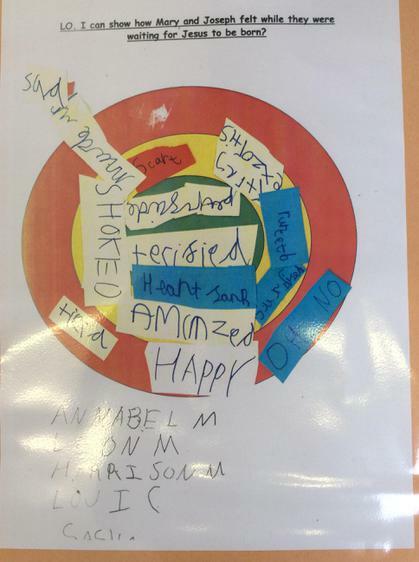 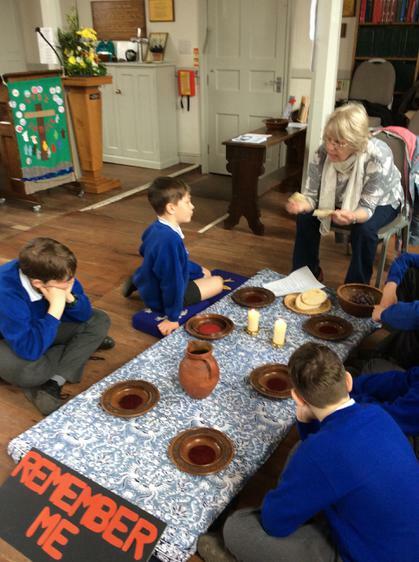 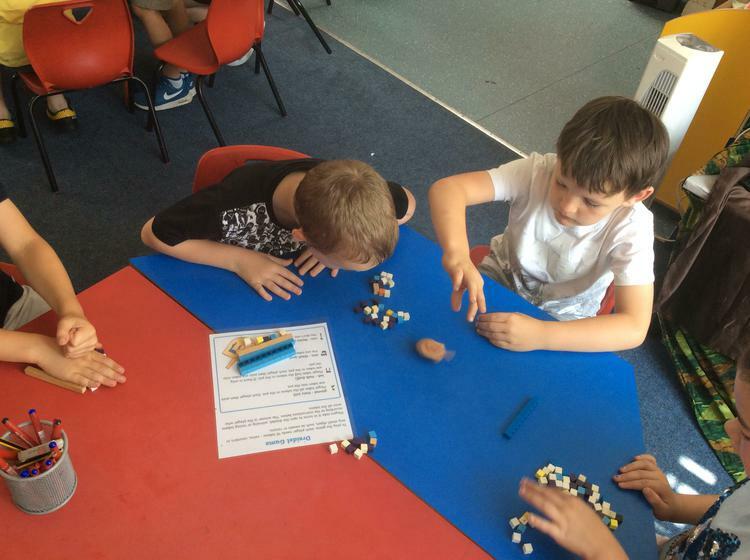 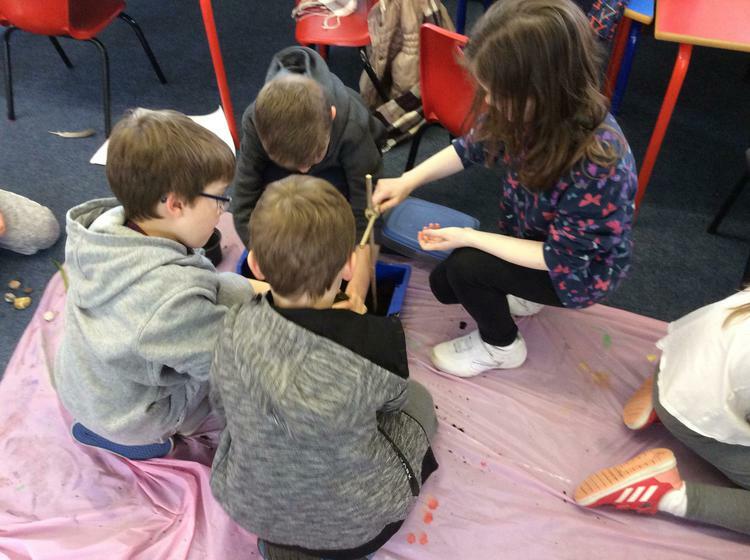 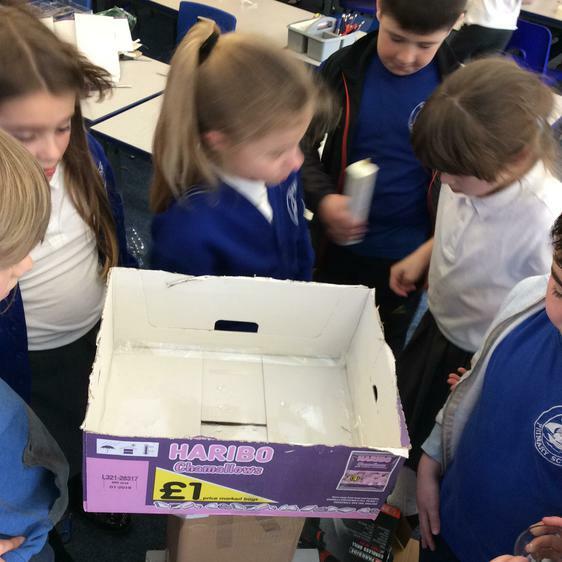 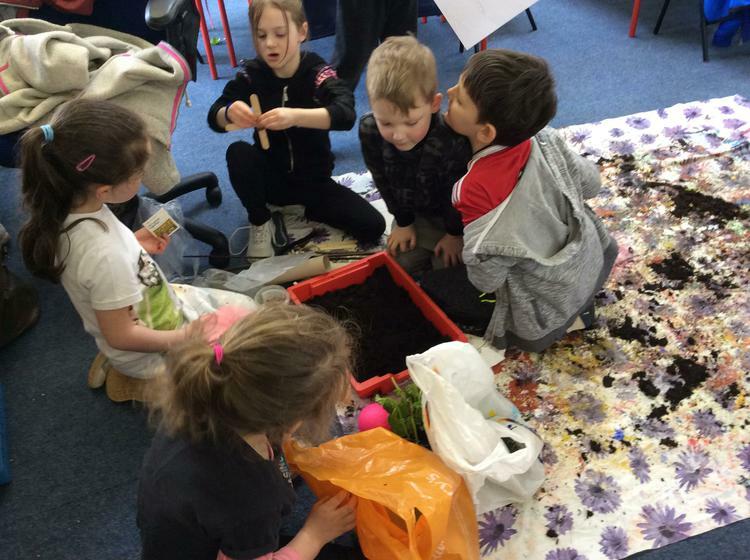 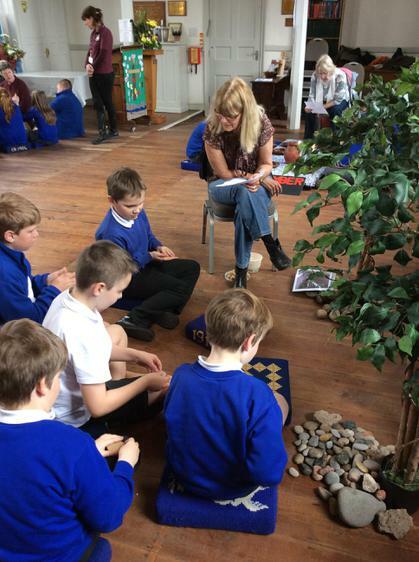 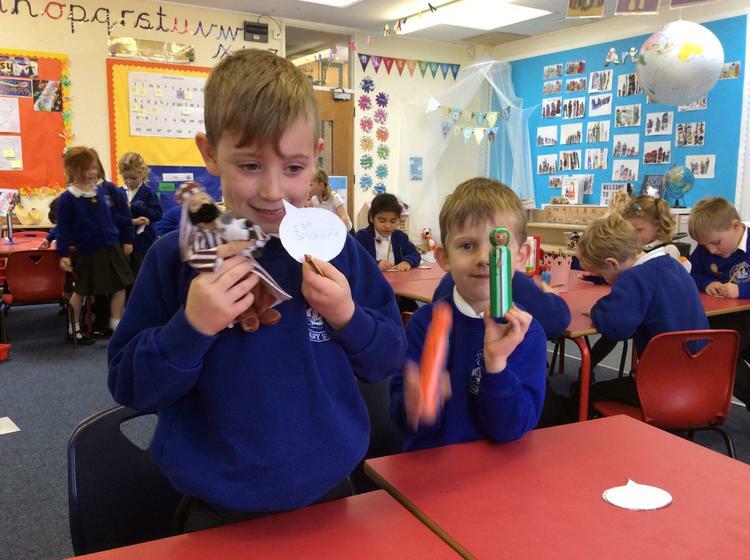 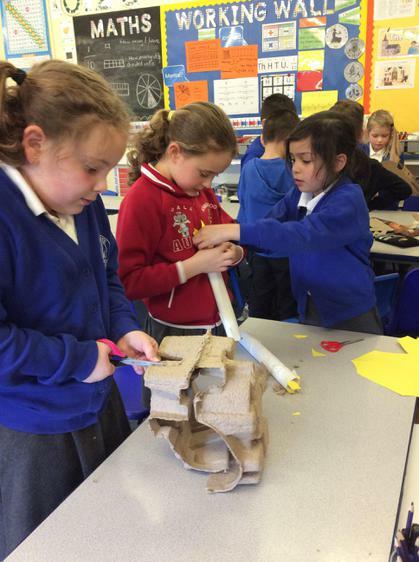 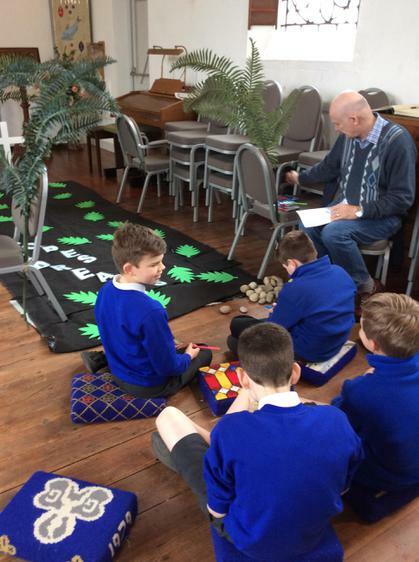 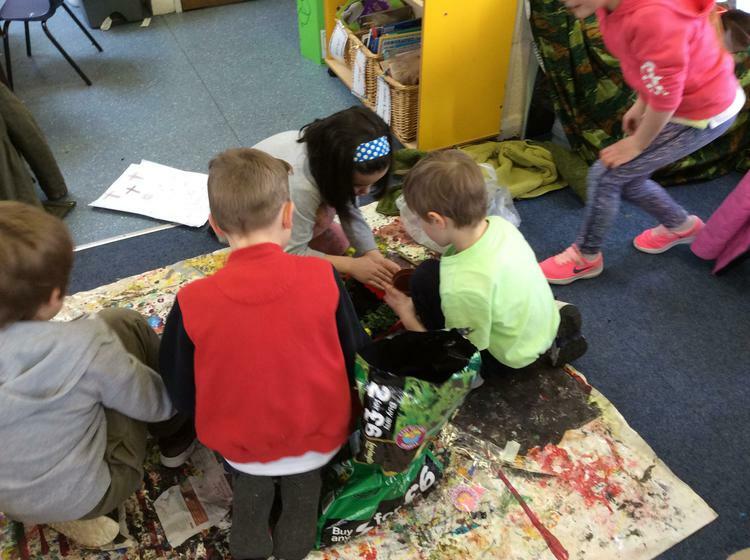 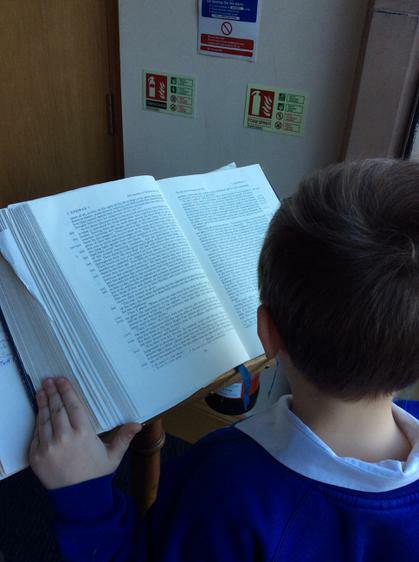 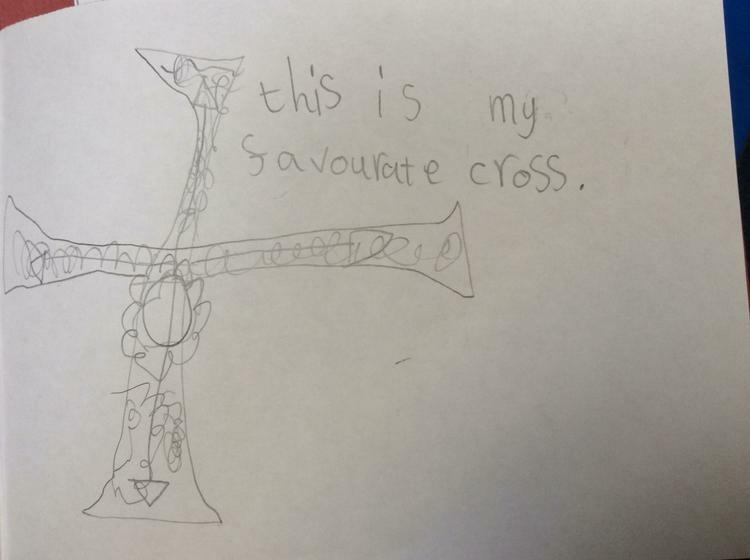 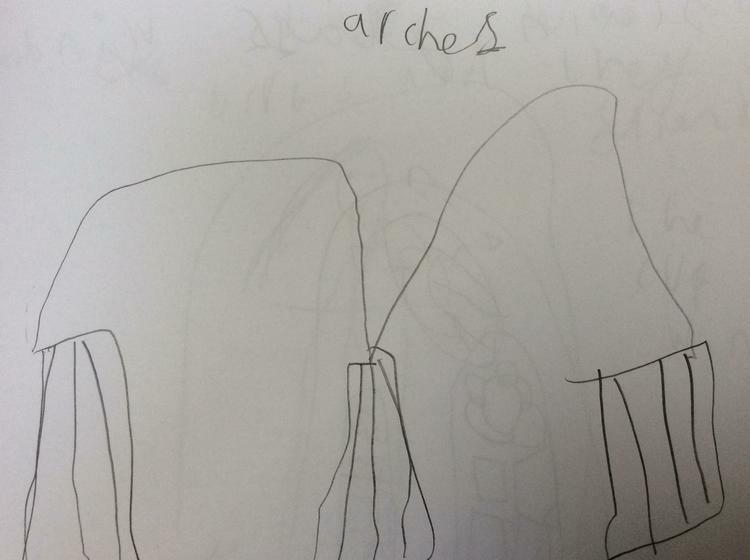 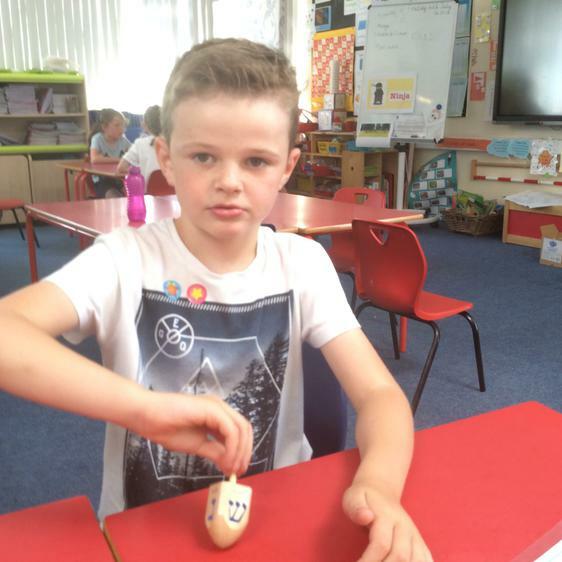 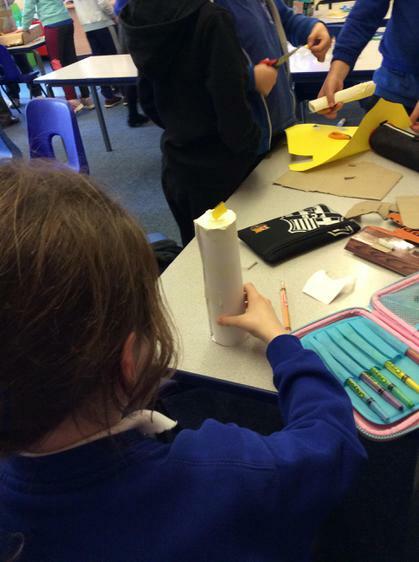 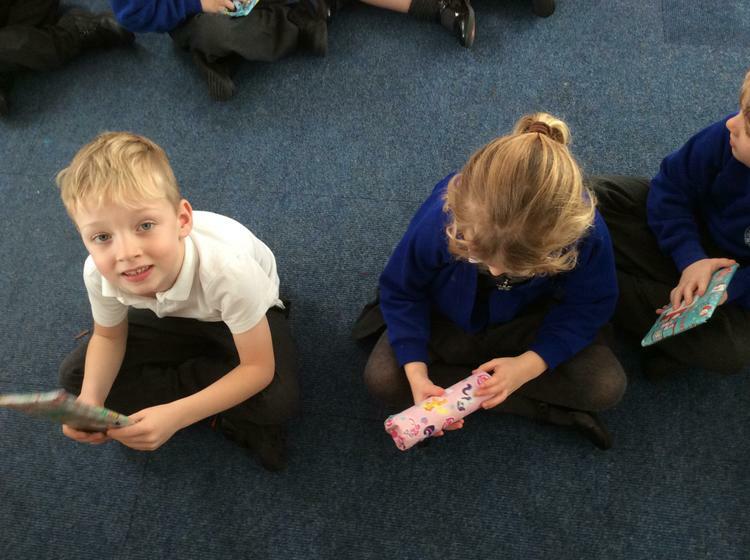 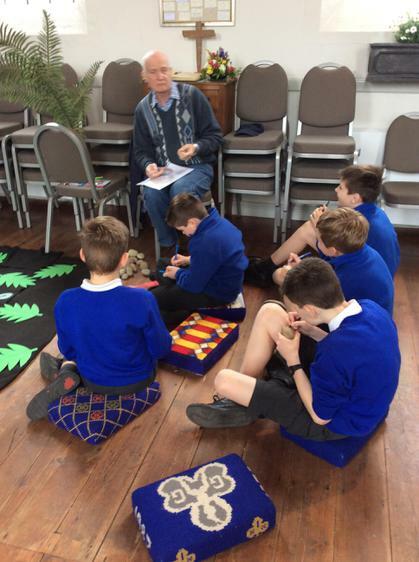 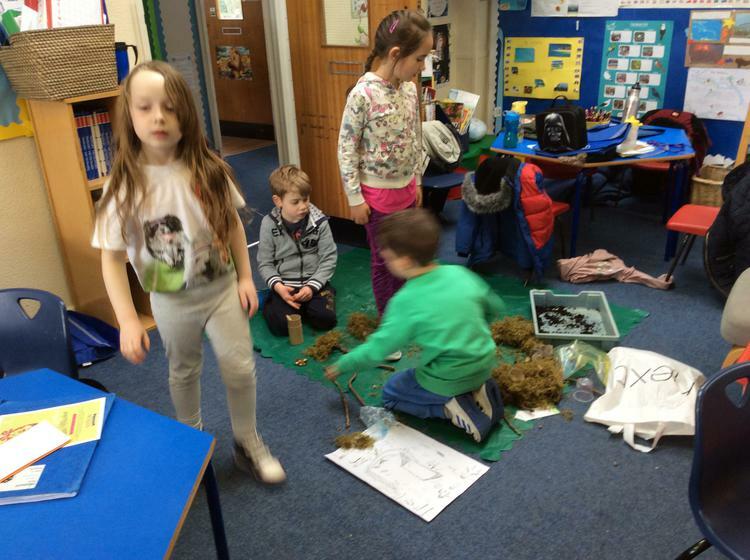 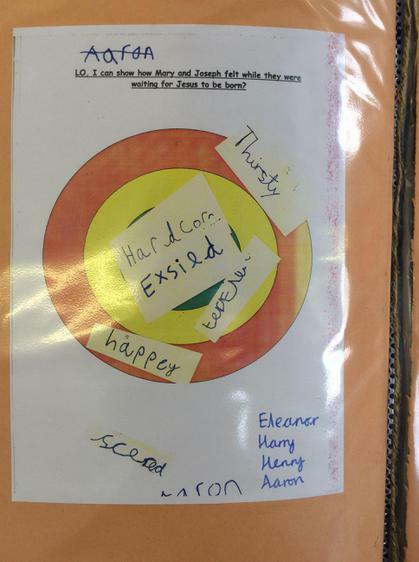 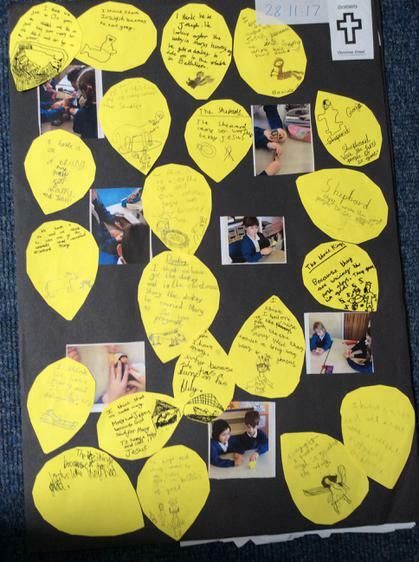 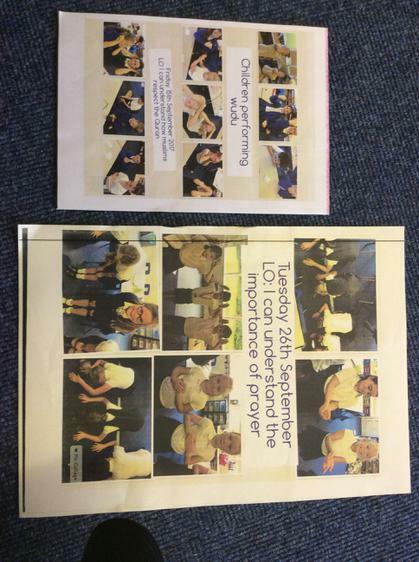 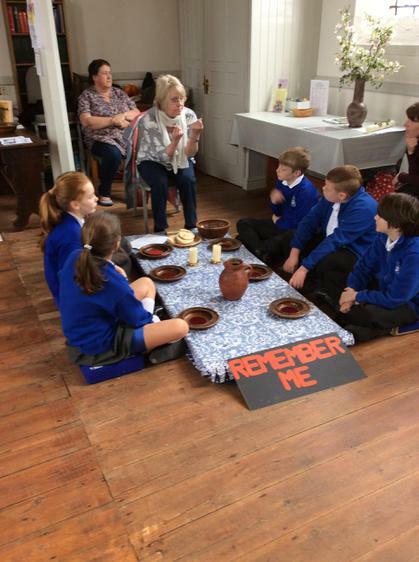 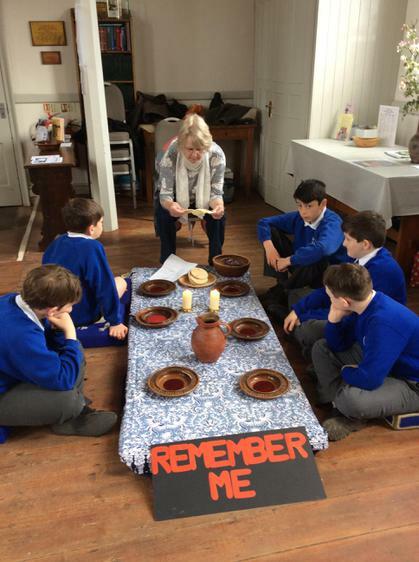 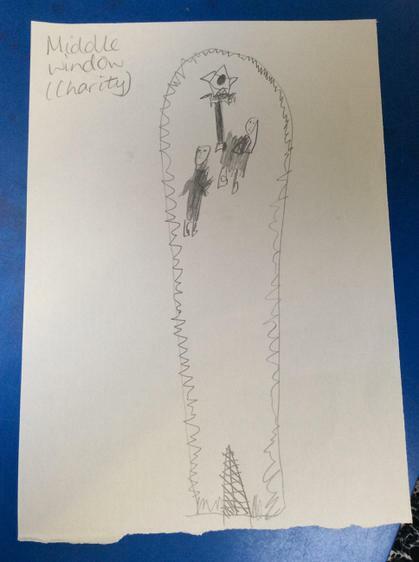 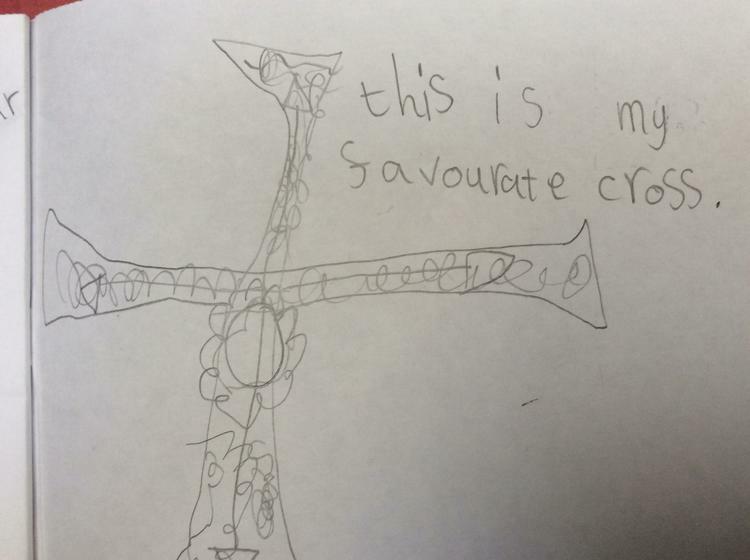 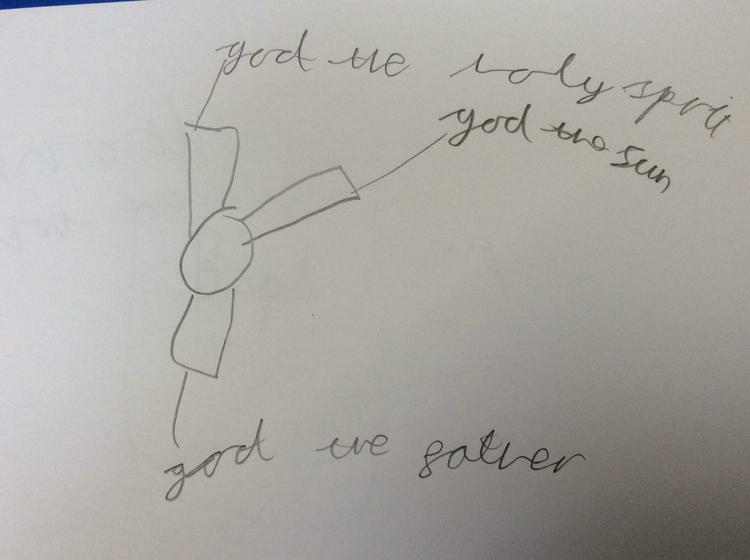 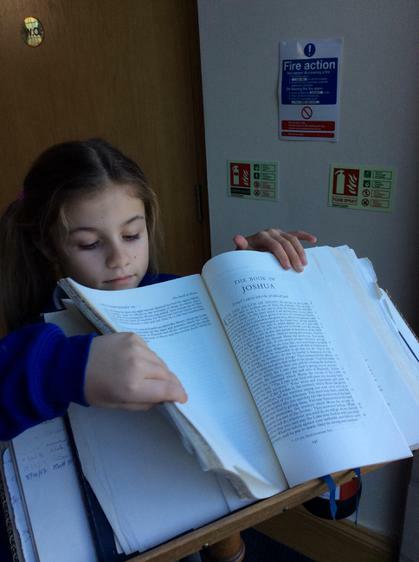 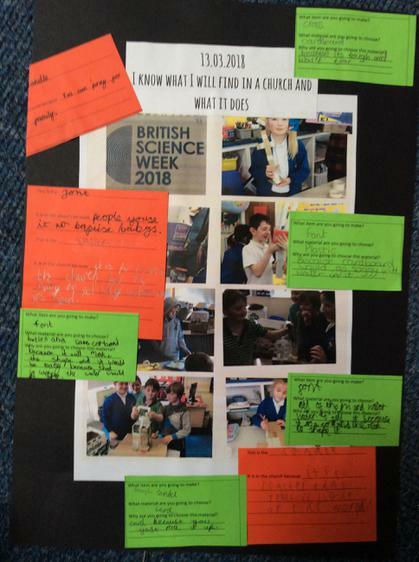 Following on from their visit to The United Reformed Church and as part of British Science Week Lemurs made the artefacts which they had seen at the church, choosing carefully the most appropriate material. 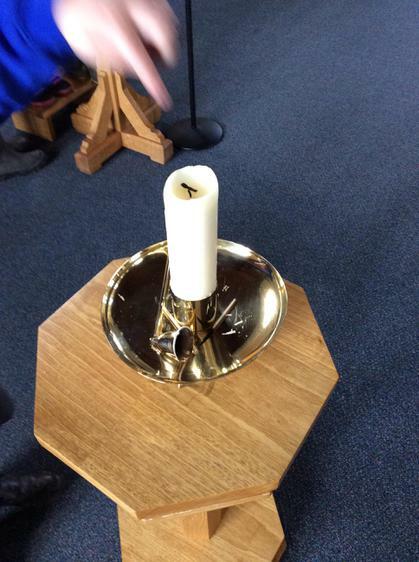 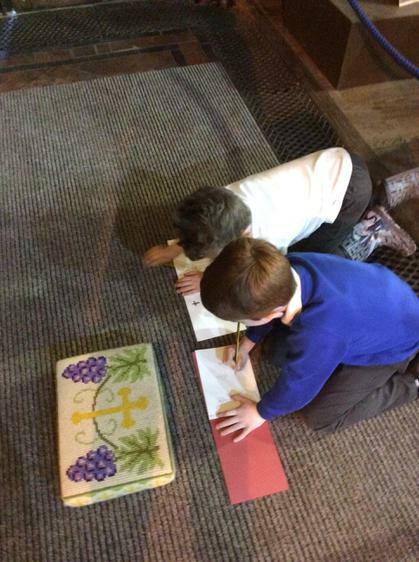 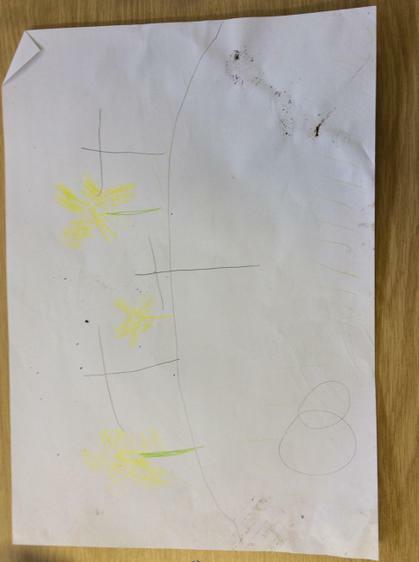 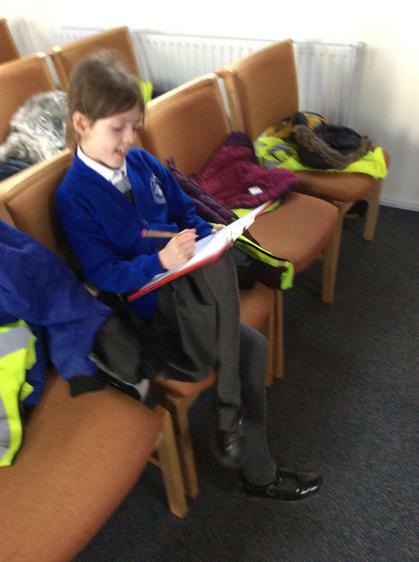 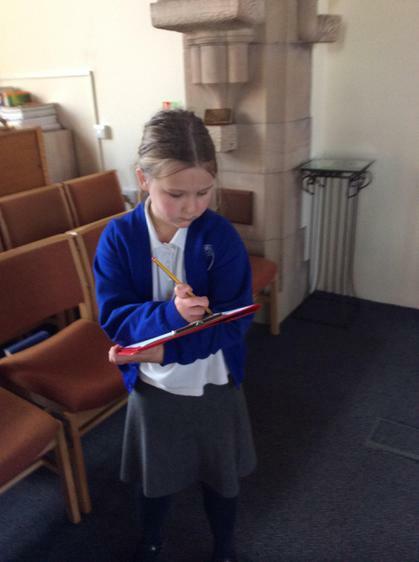 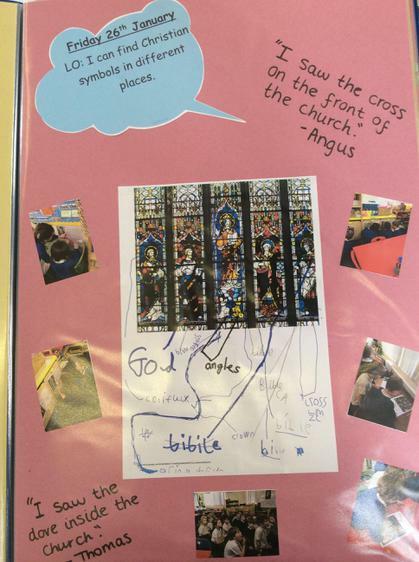 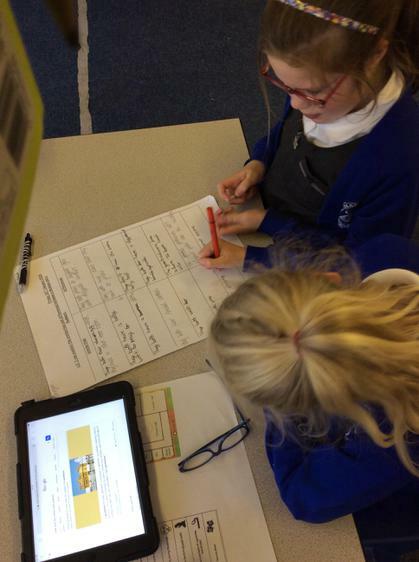 Lemur class have been investigating different churches as part of their Big Question. 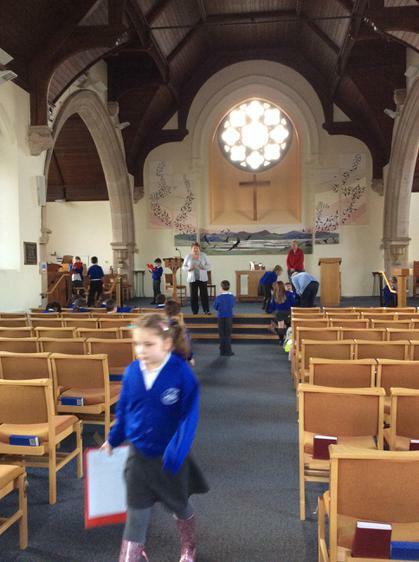 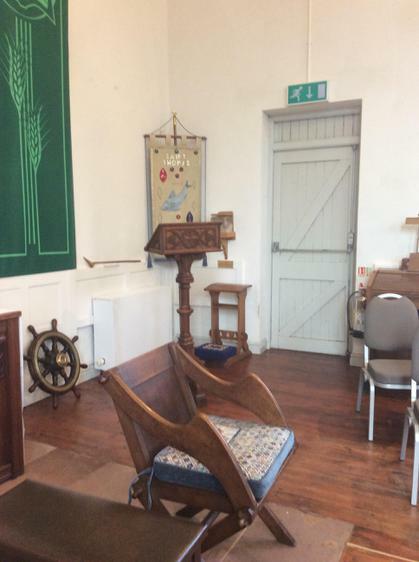 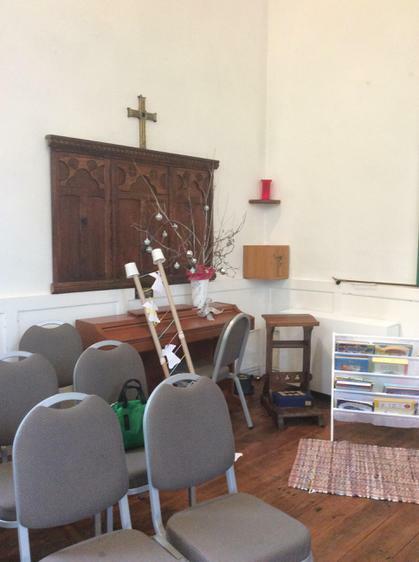 As part of their investigation they visited the United Reform Church. 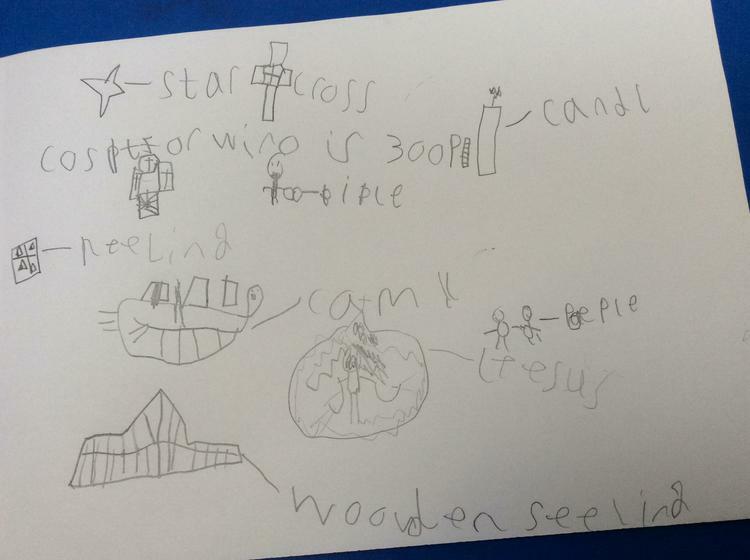 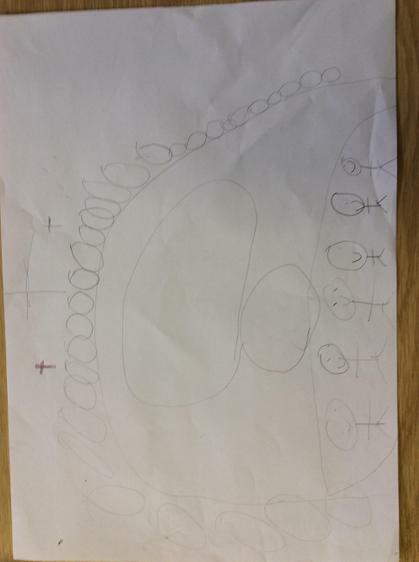 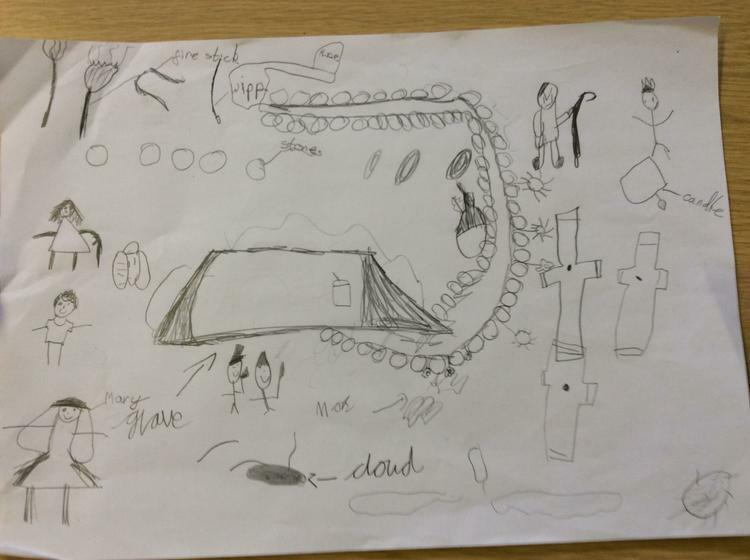 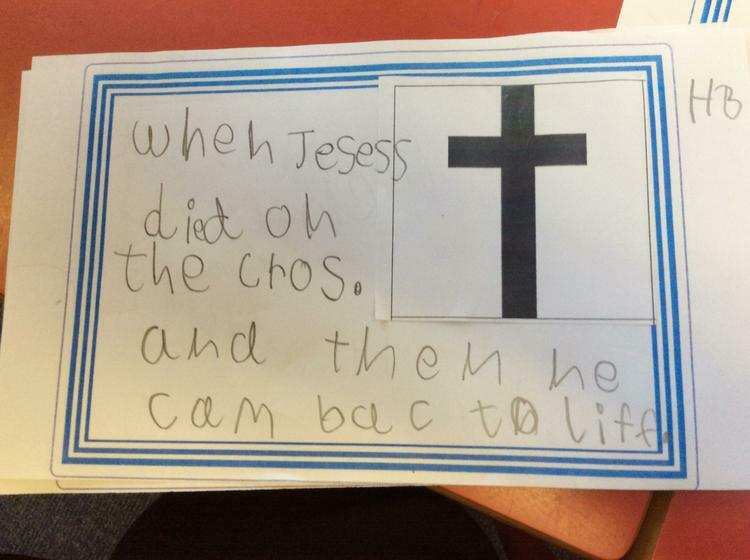 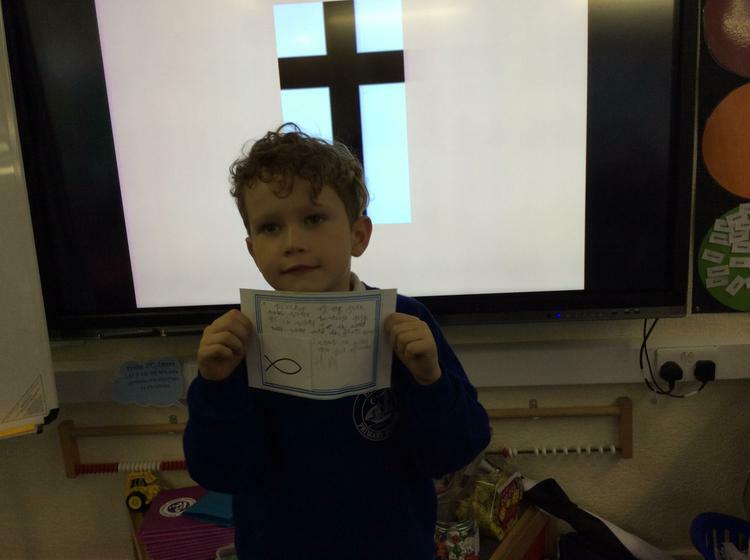 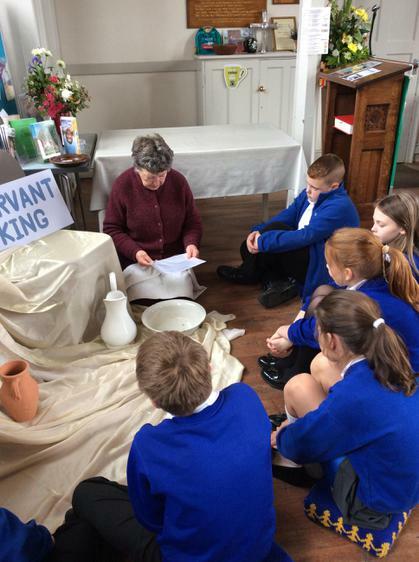 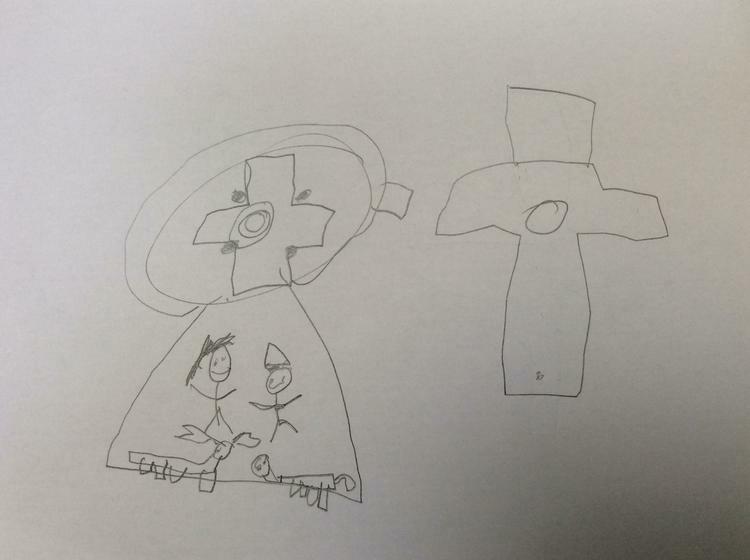 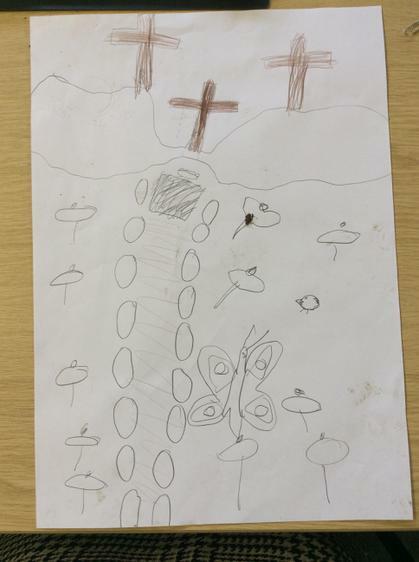 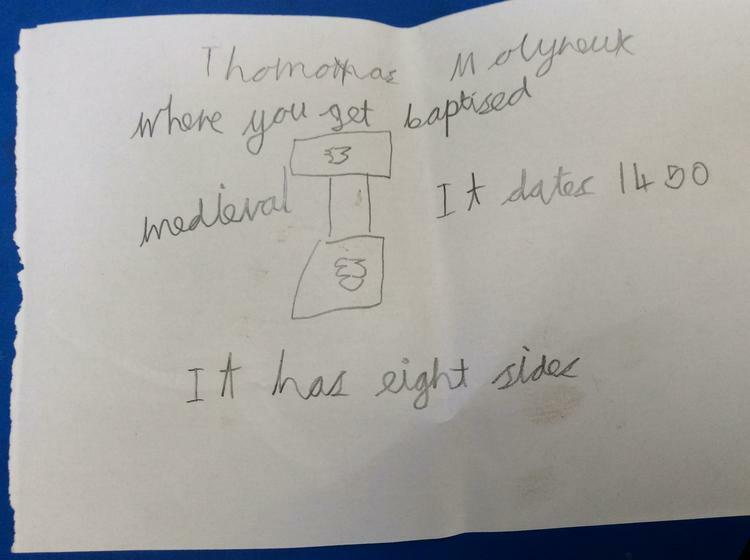 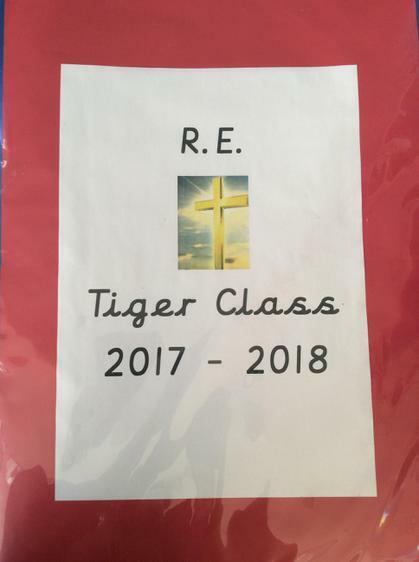 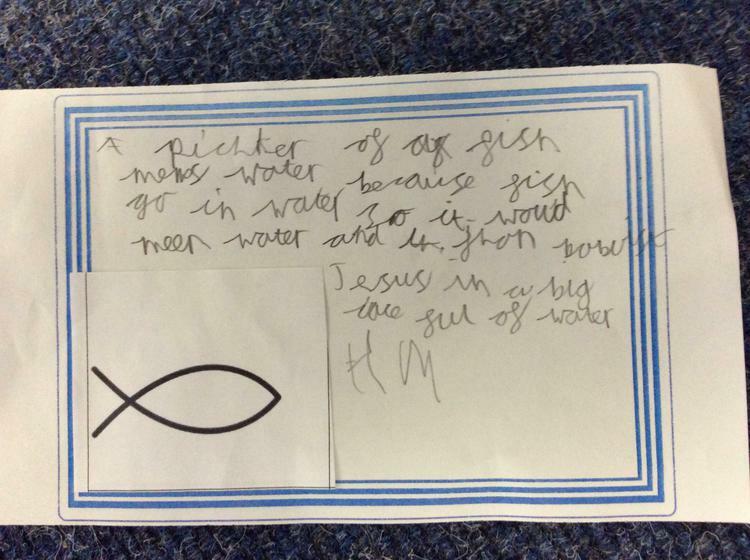 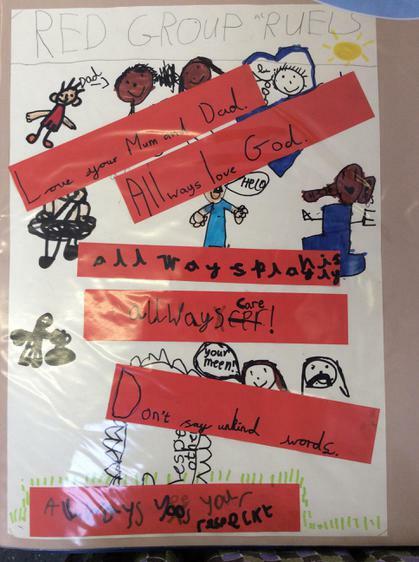 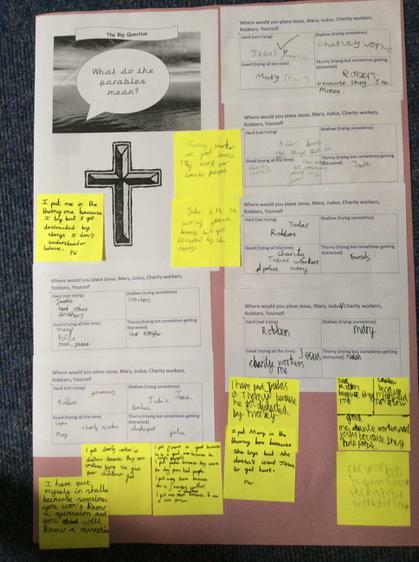 Tiger class' Big Questions have led them to look at the church and baptism. 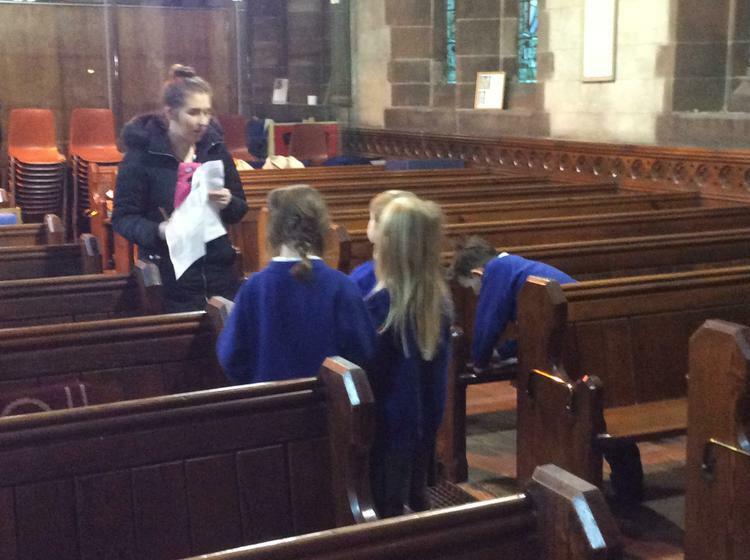 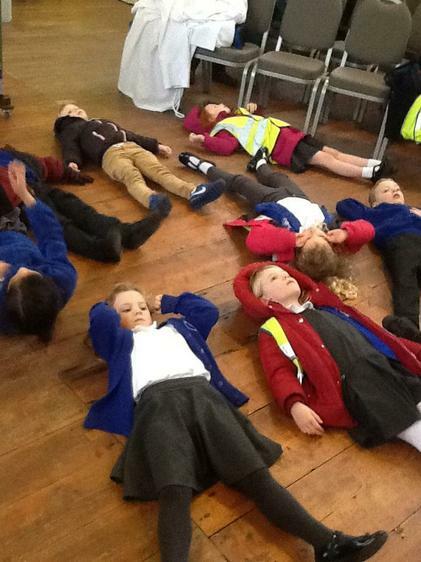 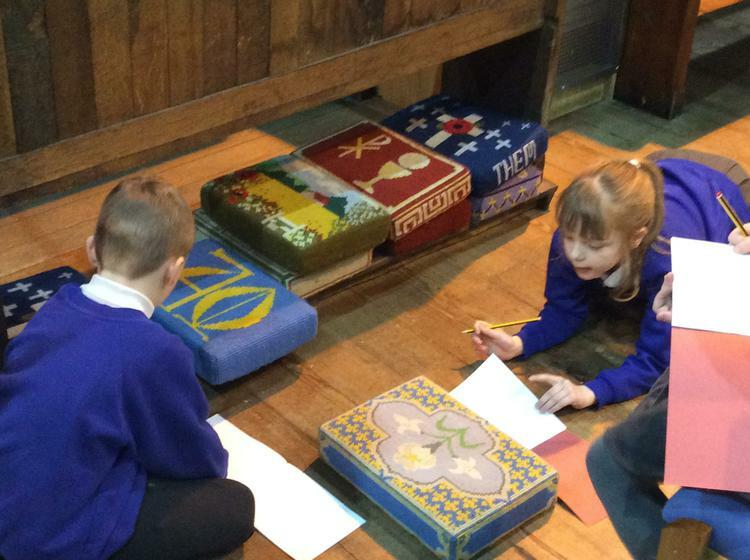 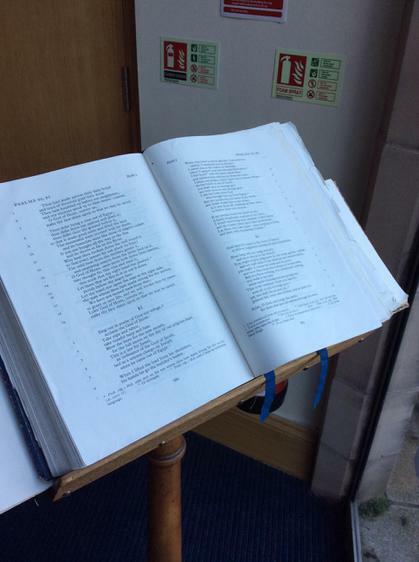 As part of their investigations they visited St Thomas' church. 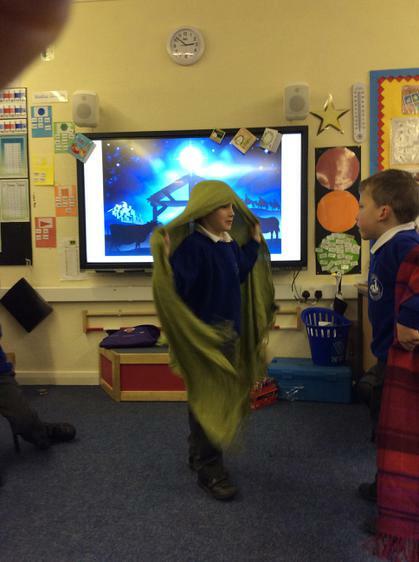 Dr Storer showed them his robes and answered their questions. 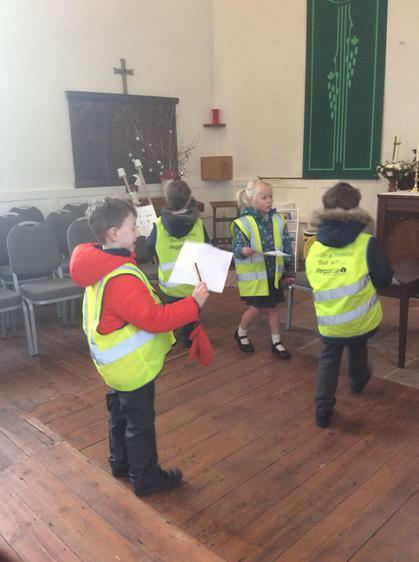 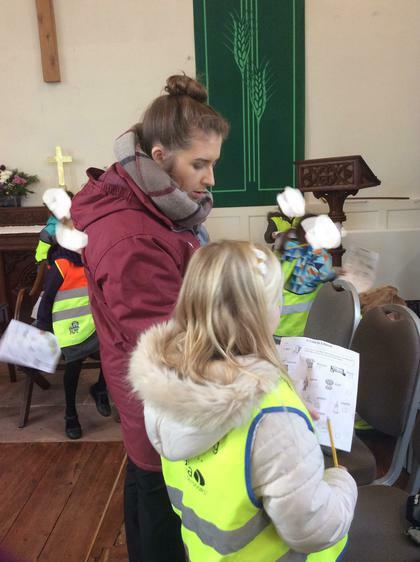 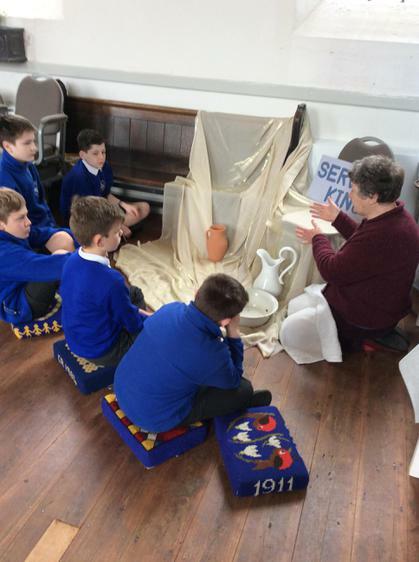 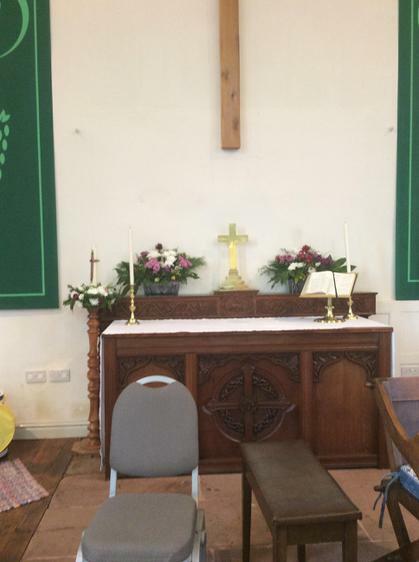 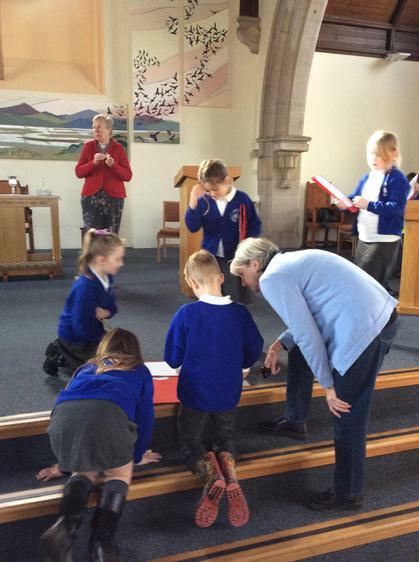 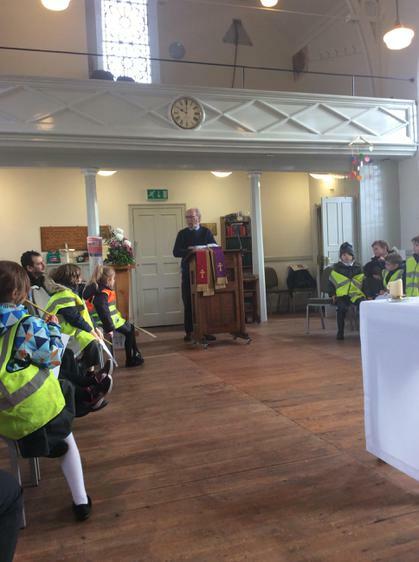 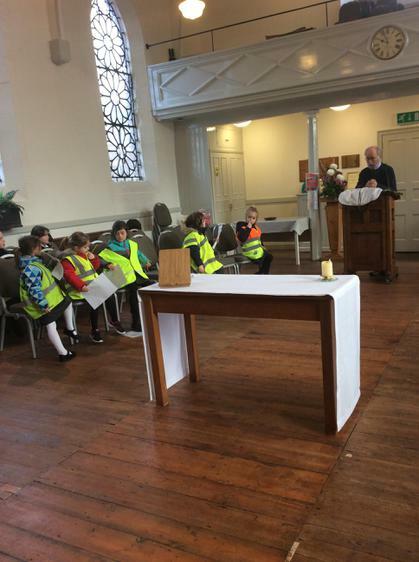 As part of their Big Question about why symbols are important to Christians Penguin class visited the parish church of St Mary's and St Helen's, Neston. 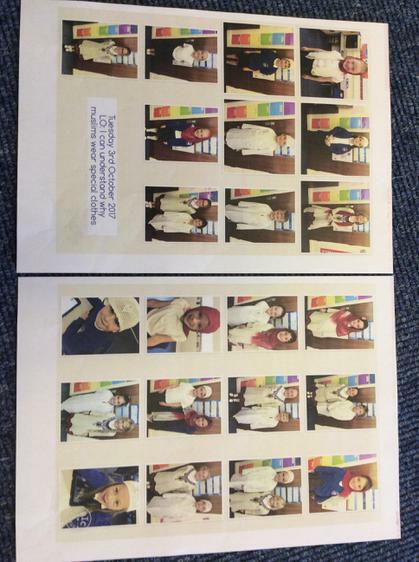 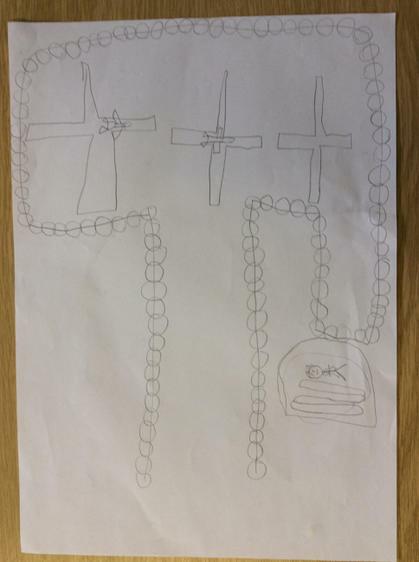 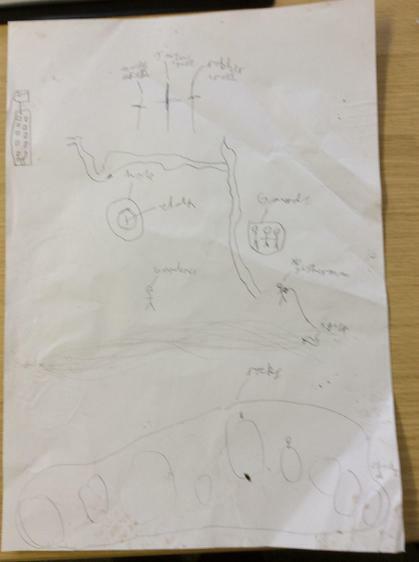 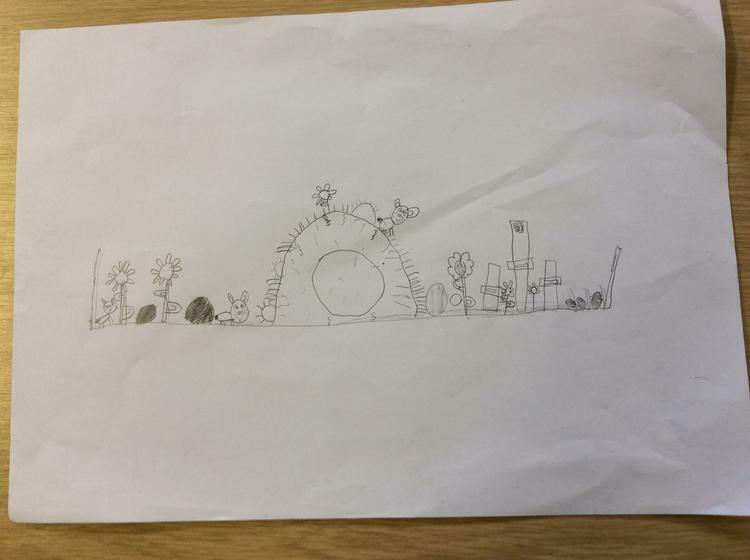 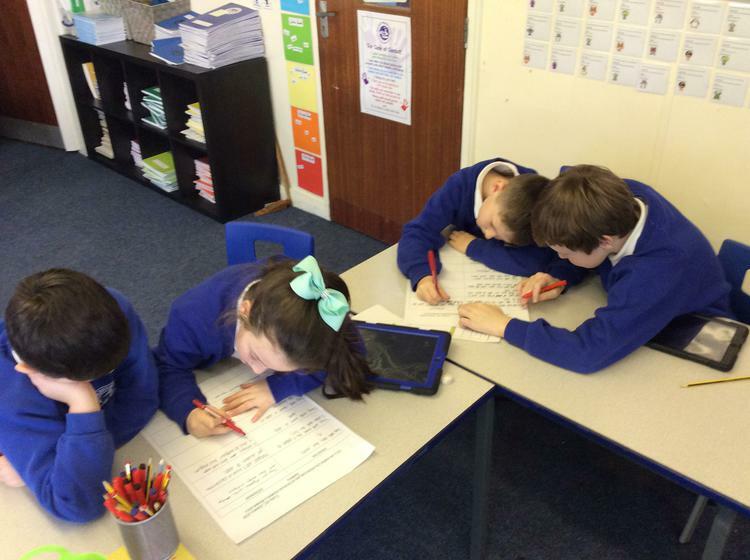 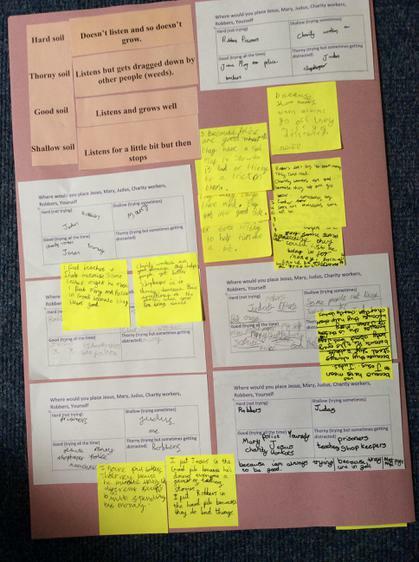 As part of their Sikhism topic Jaguar class have been investigating the difference between a Mosque and a Gurdwara. 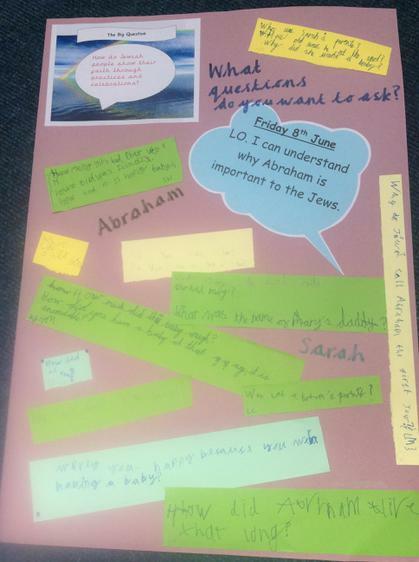 Tiger Class have spent a lot of time investigating their Big Questions. 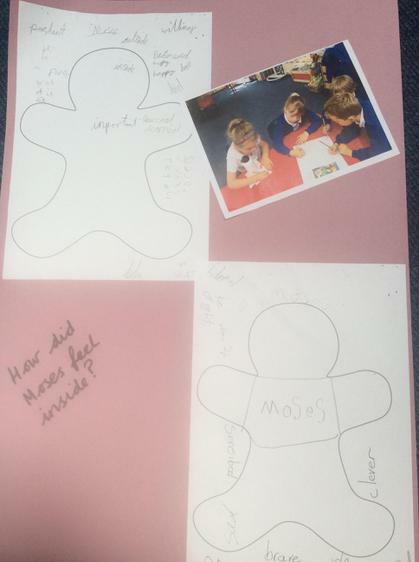 year 3 have been investigating different questions. 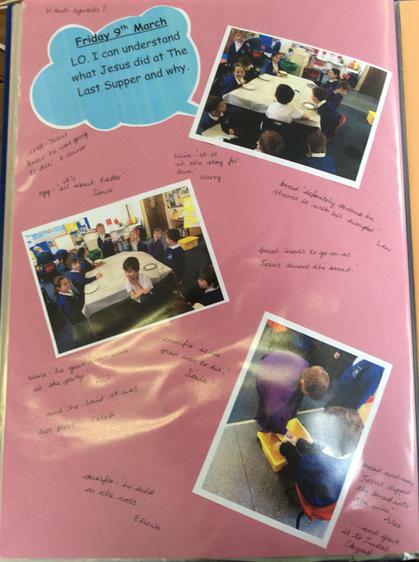 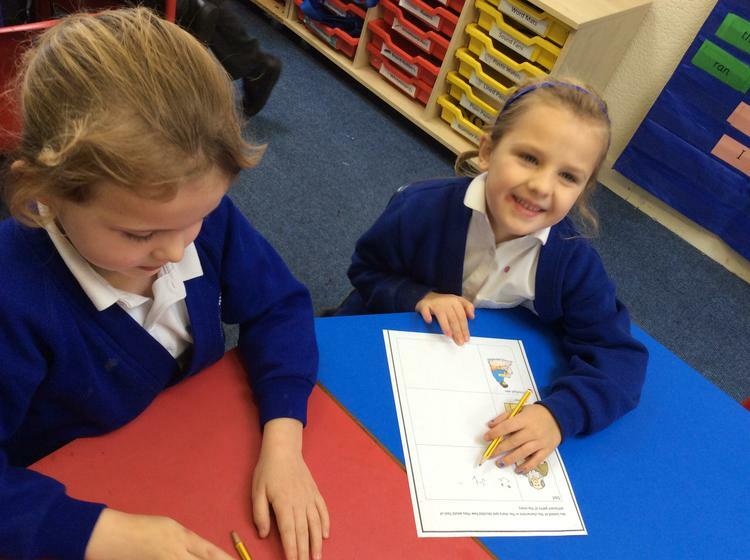 Year 3 have been filling their floor book with lots of investigations and discussions. 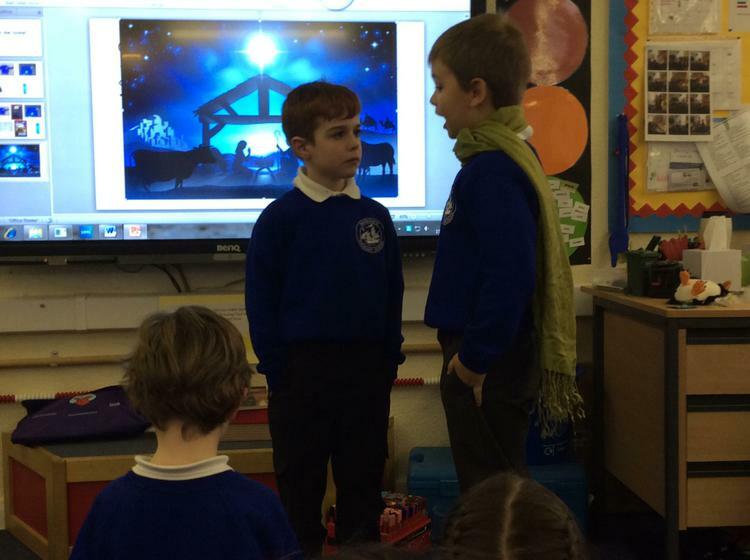 There have been a few heated debates! 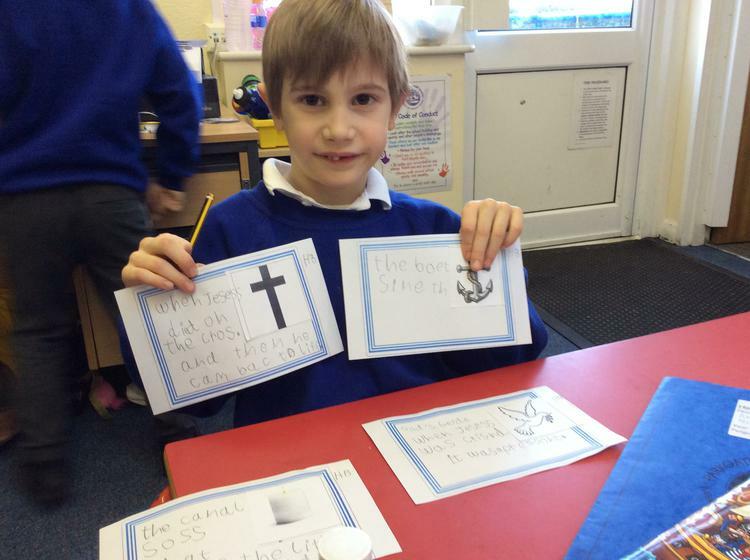 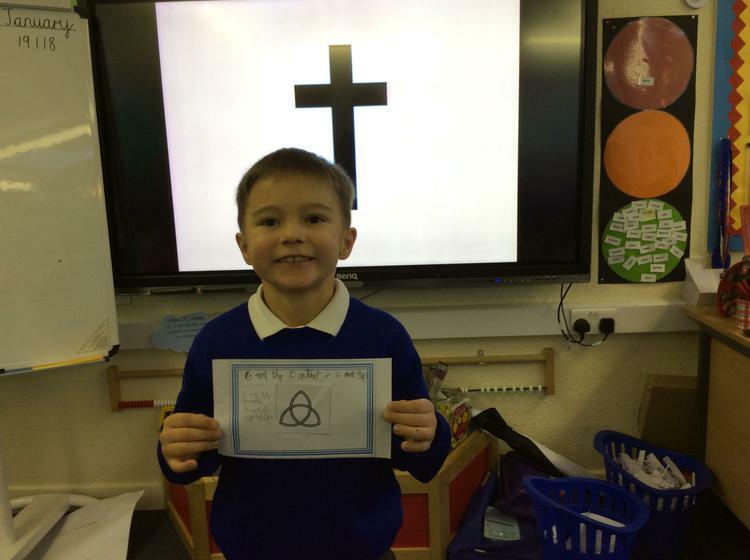 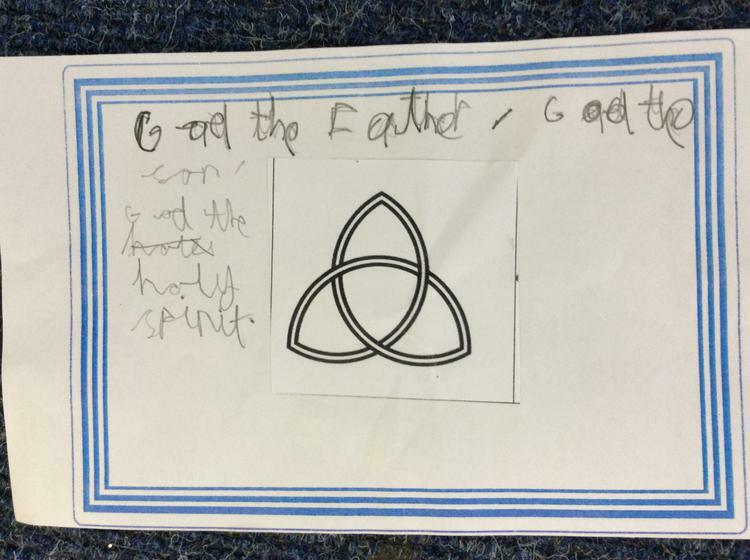 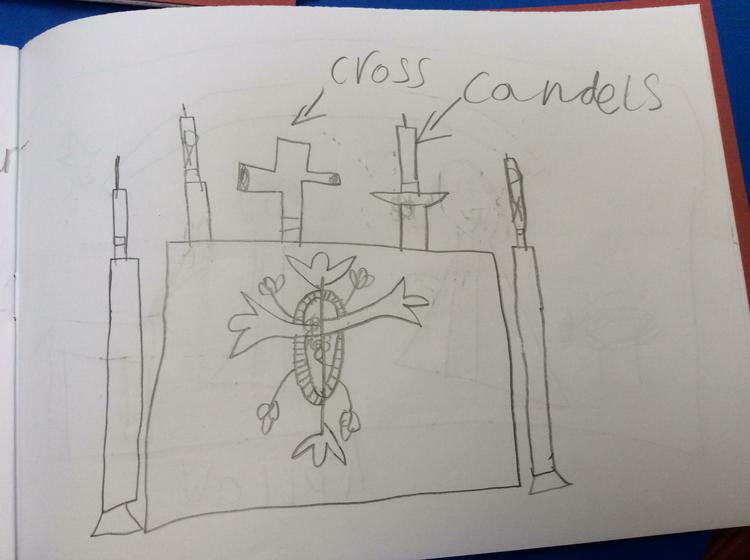 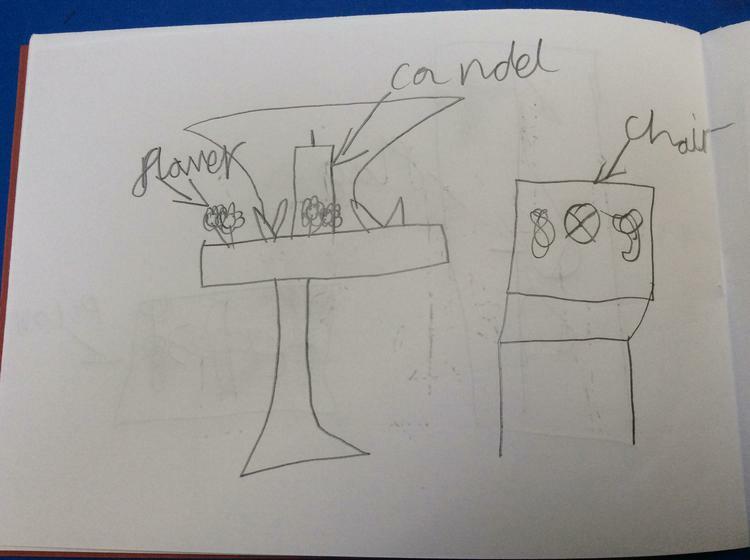 Penguins used their knowledge to decide what the religious symbols meant. 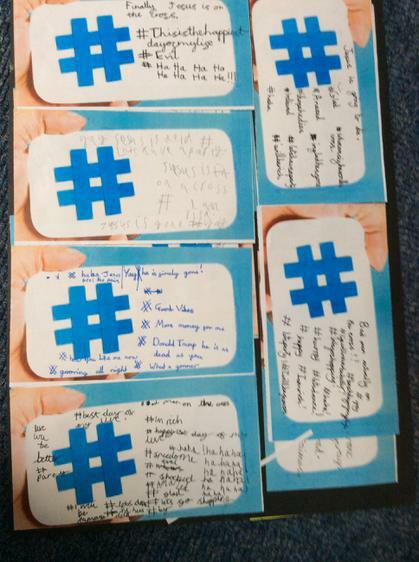 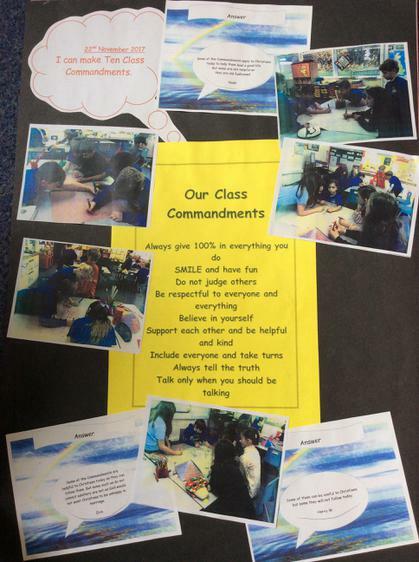 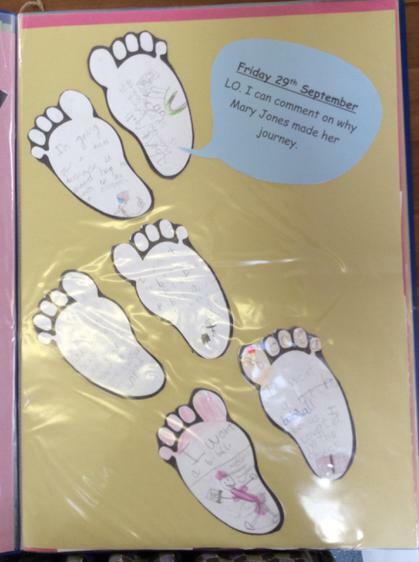 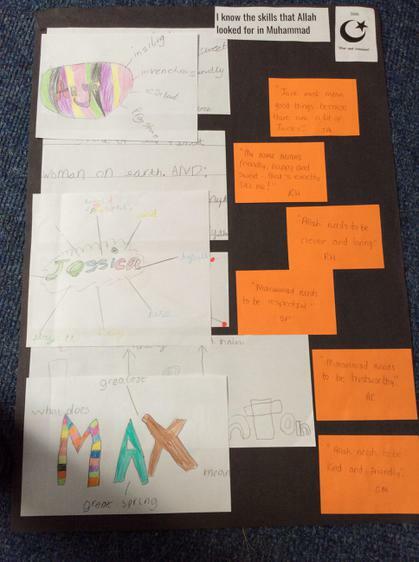 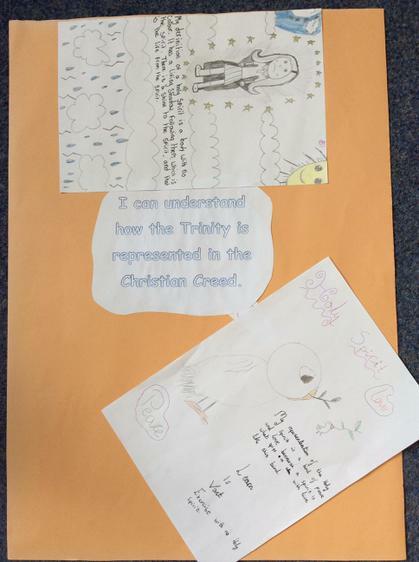 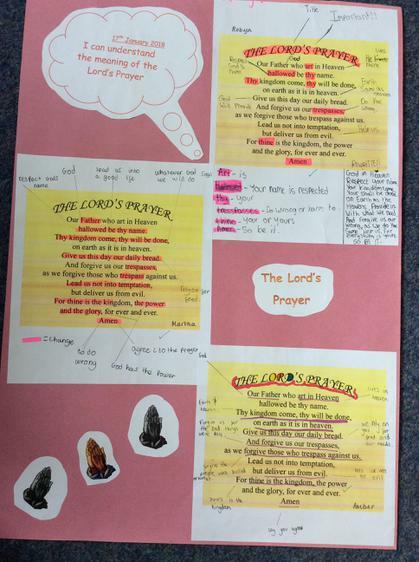 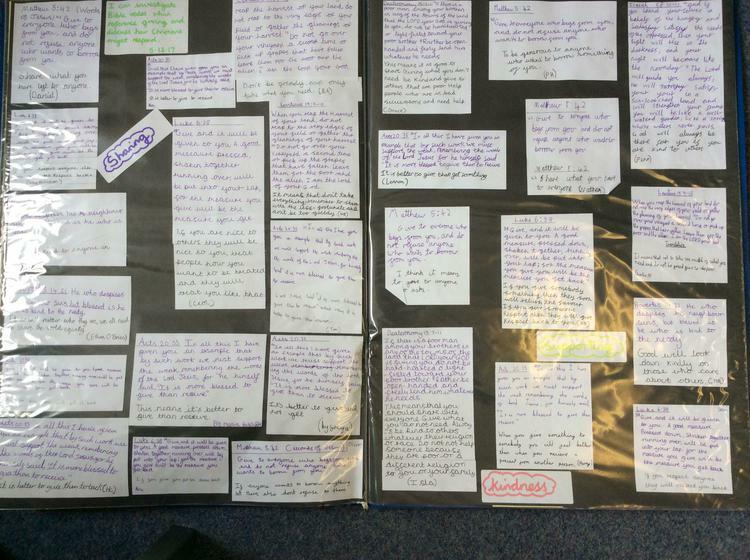 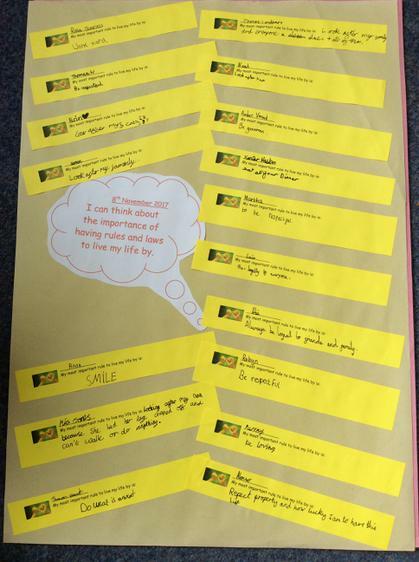 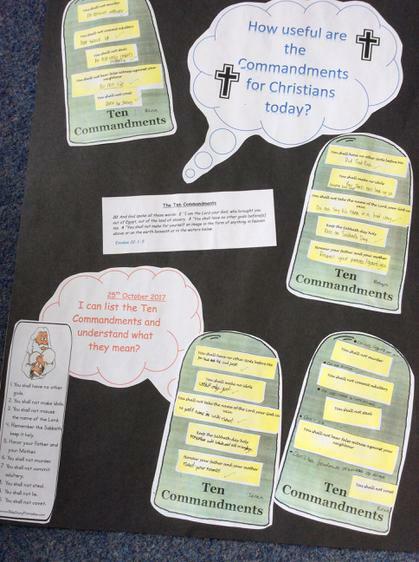 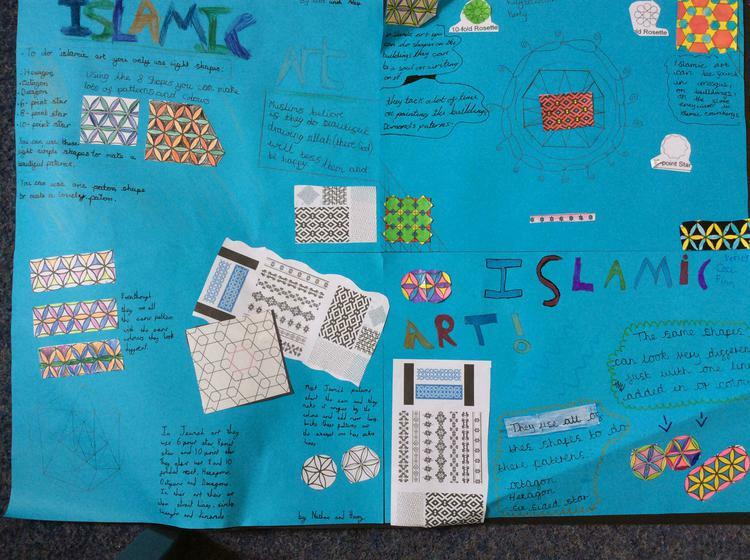 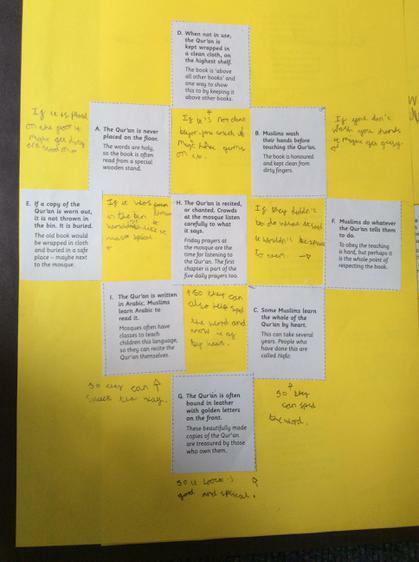 Year 4's floor book shows a real understanding of their Big Questions about Islam, Sikhism and Christianity. 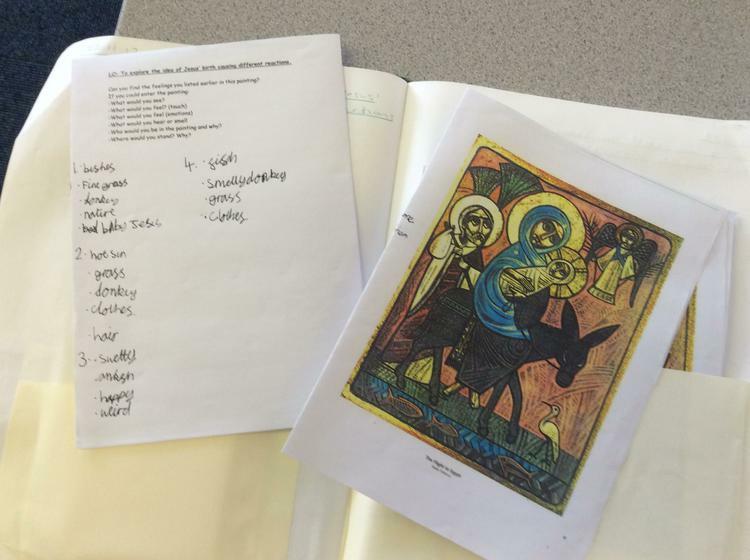 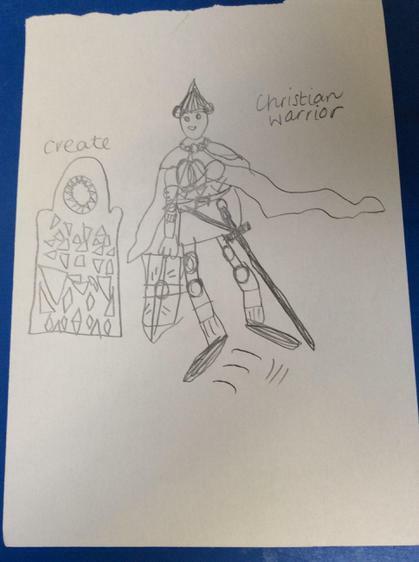 There was a lot of exploration of art works to help them understand Christian values. 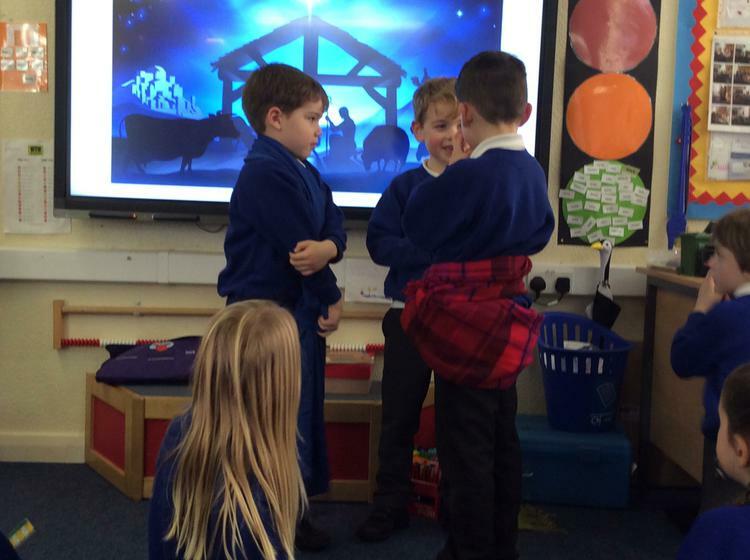 Year 2 used Conscience Alley to decide whether Jesus should have stayed at the Temple or gone home with Mary and Joseph. 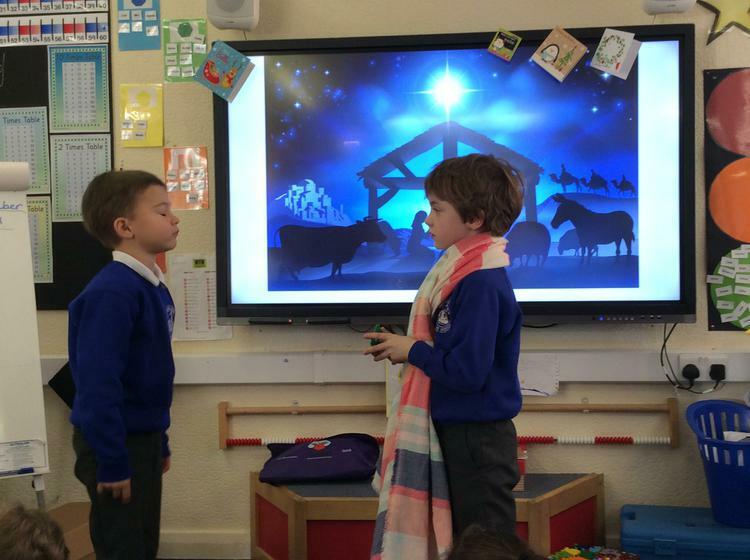 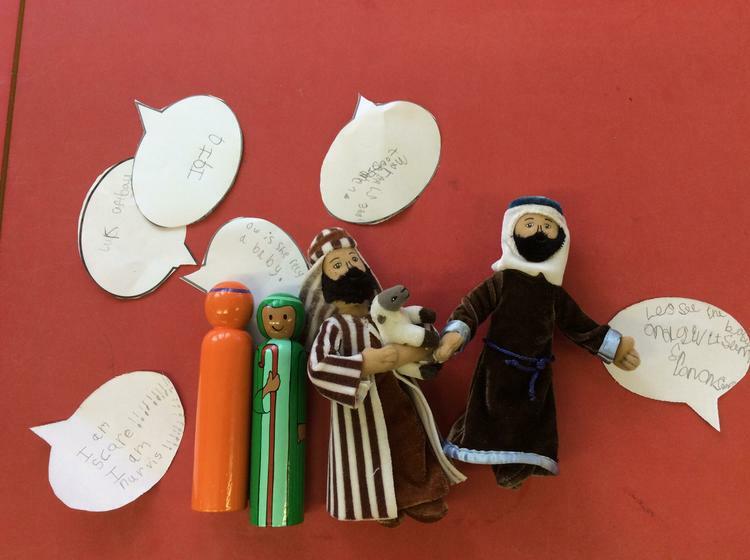 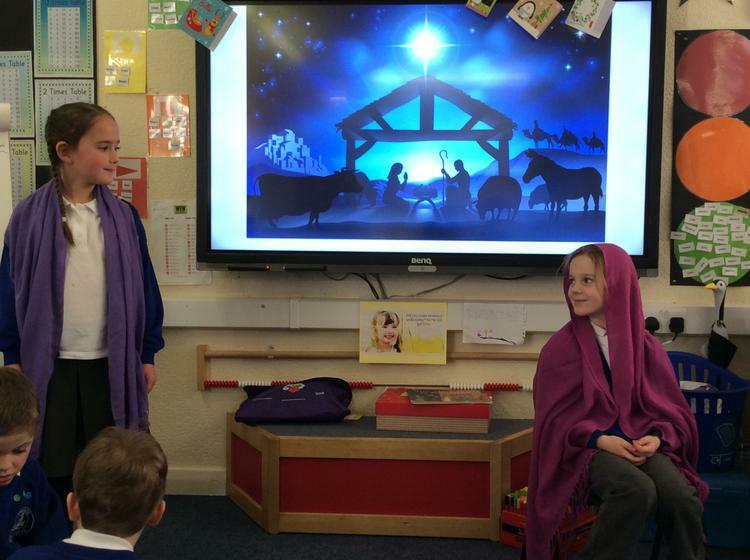 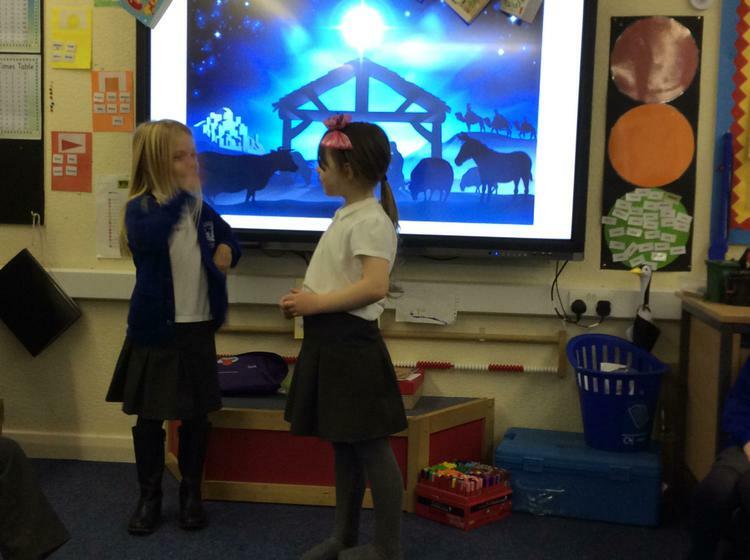 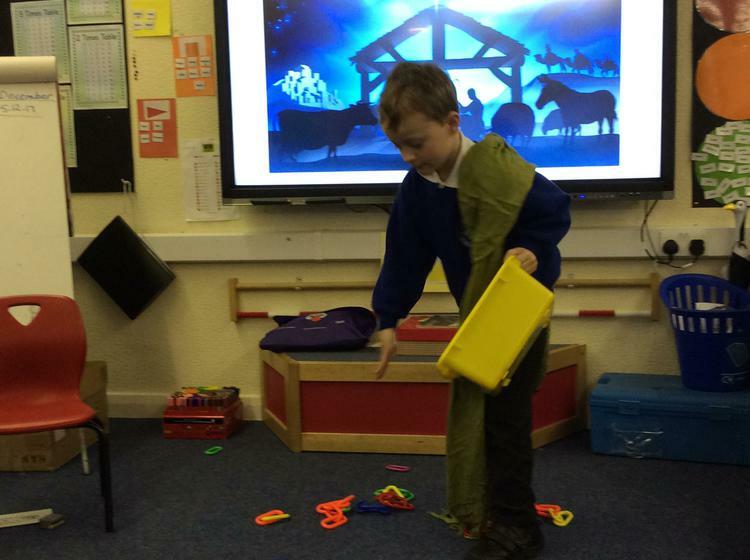 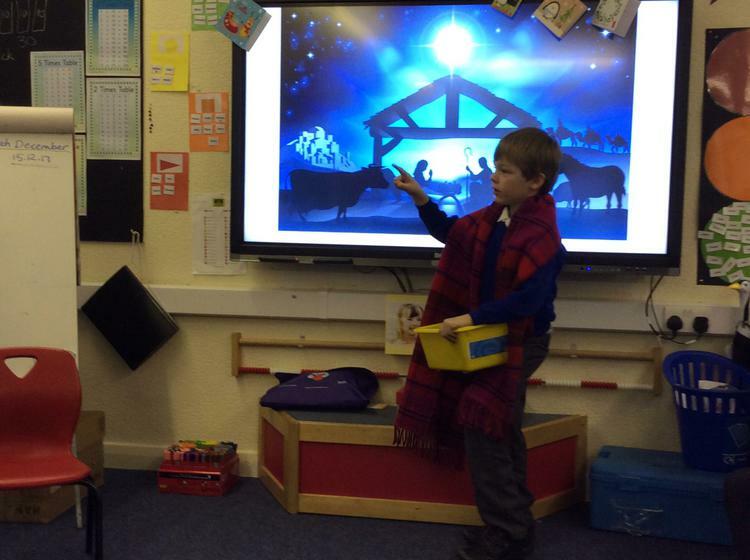 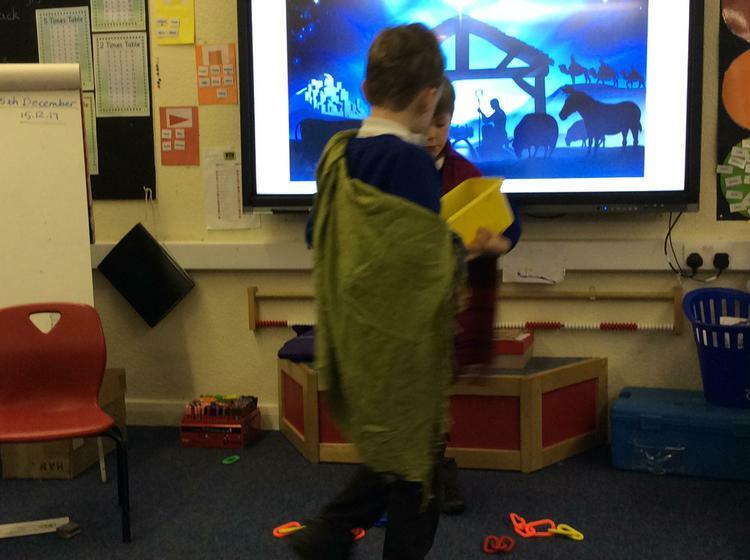 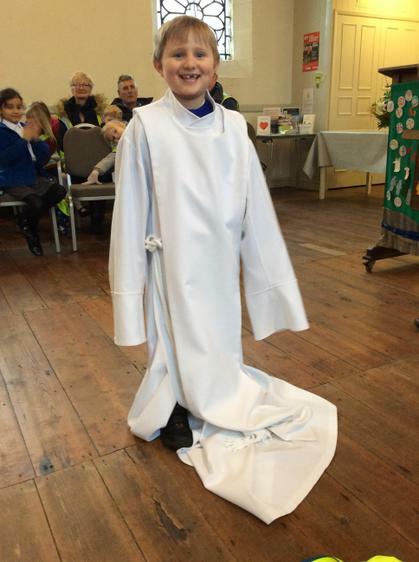 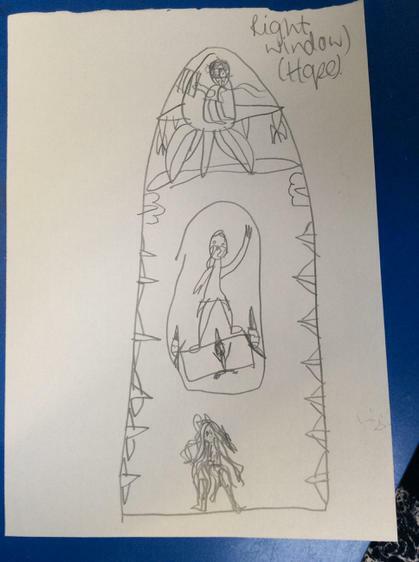 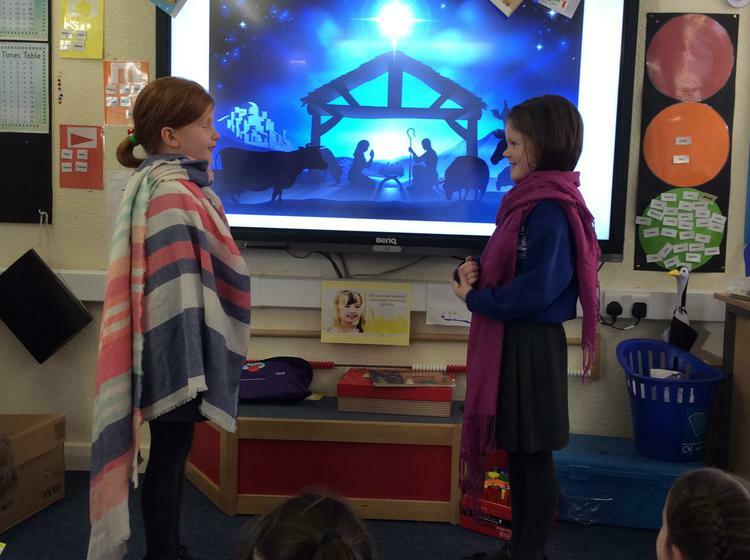 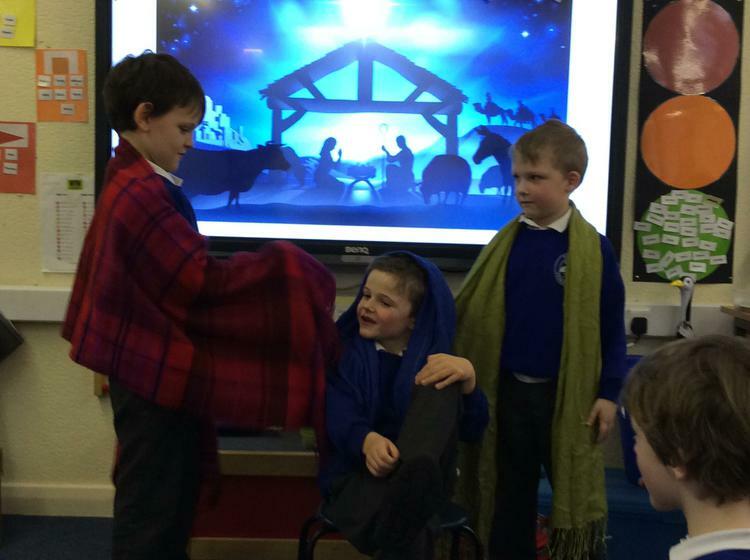 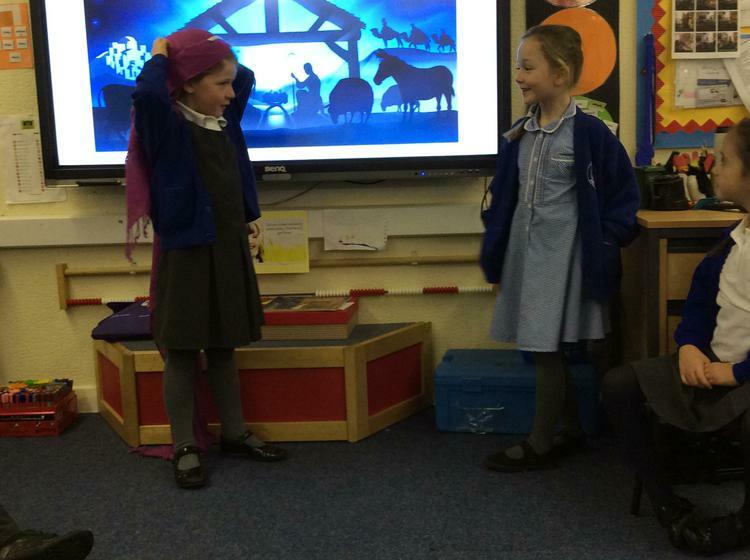 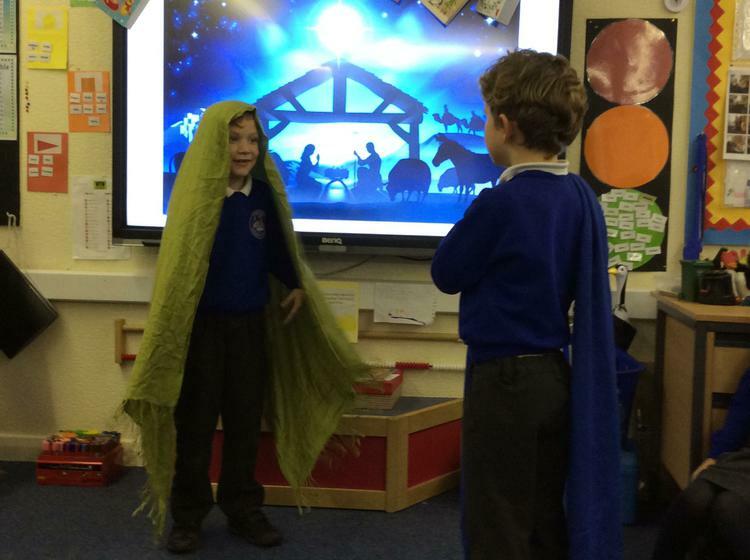 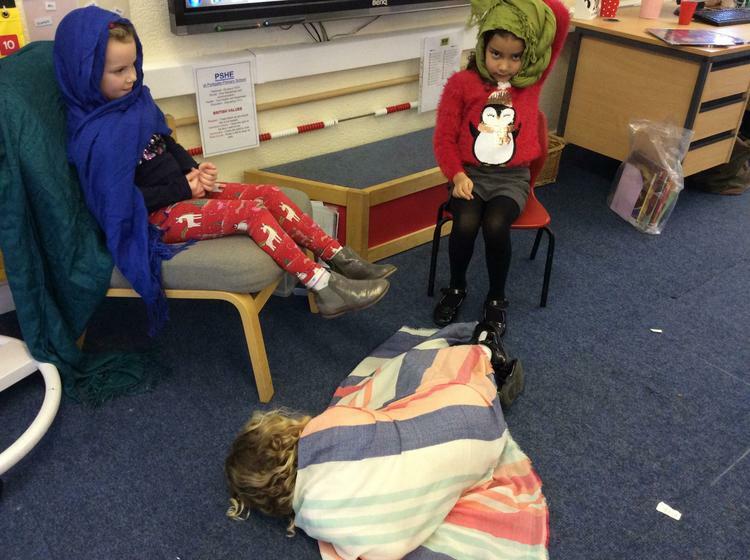 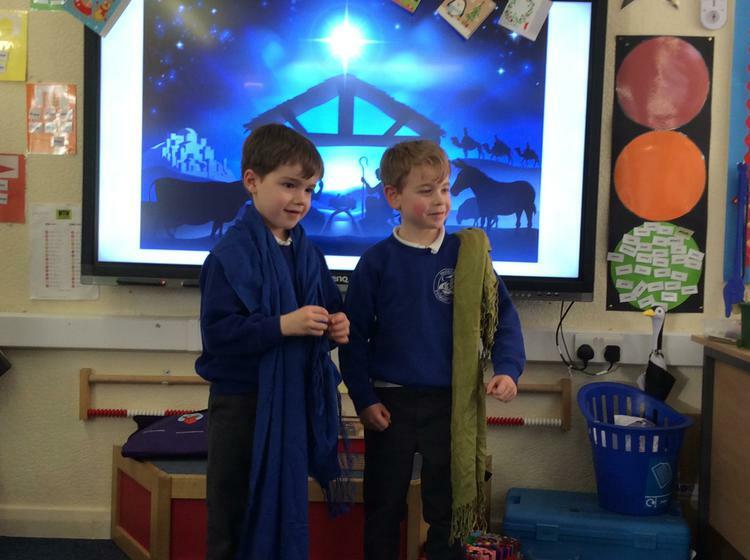 Year 2 retold the Christmas Story from the points of view of characters from their Nativity. 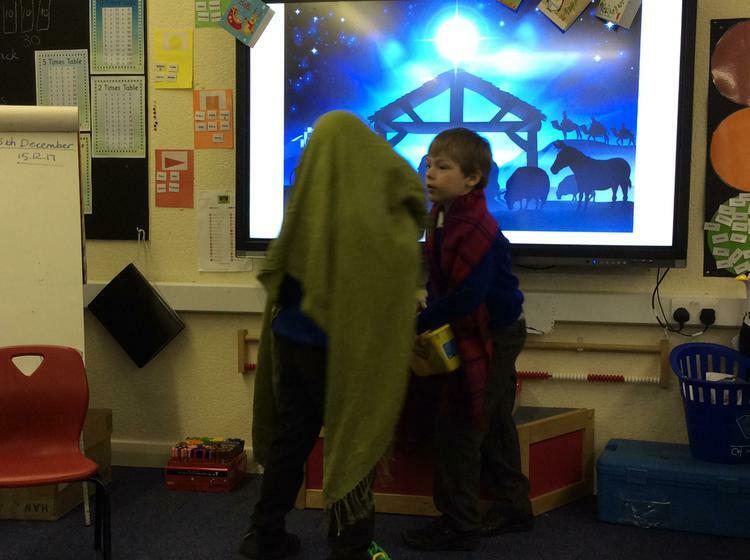 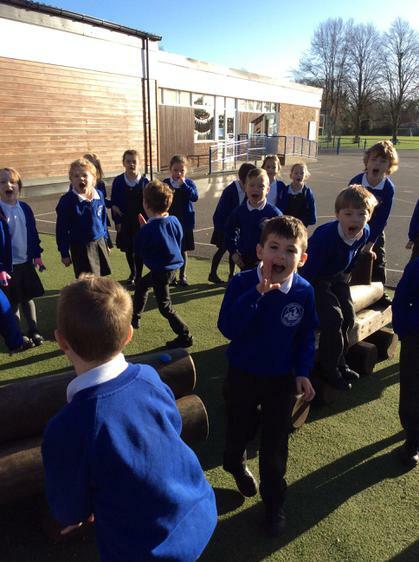 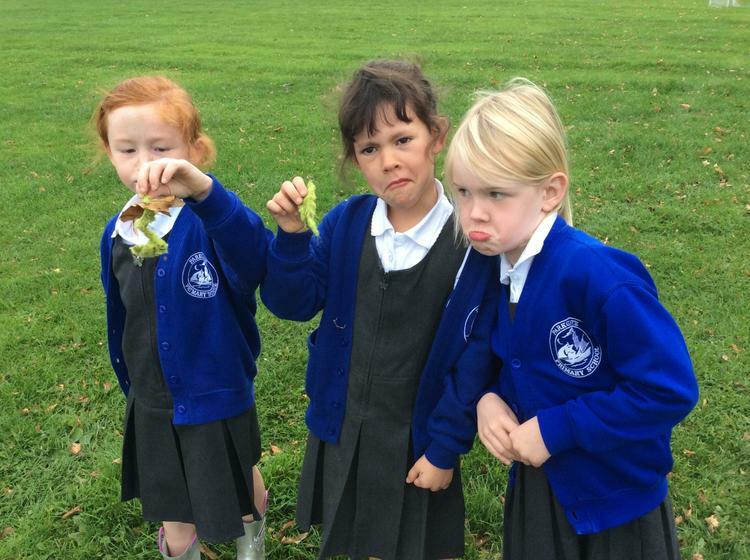 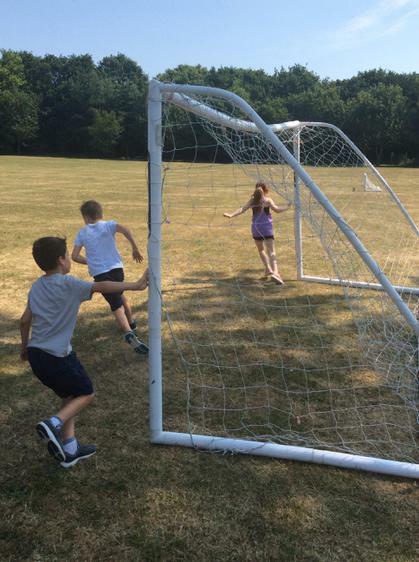 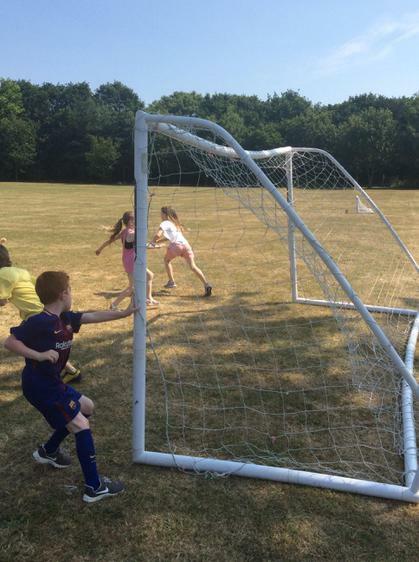 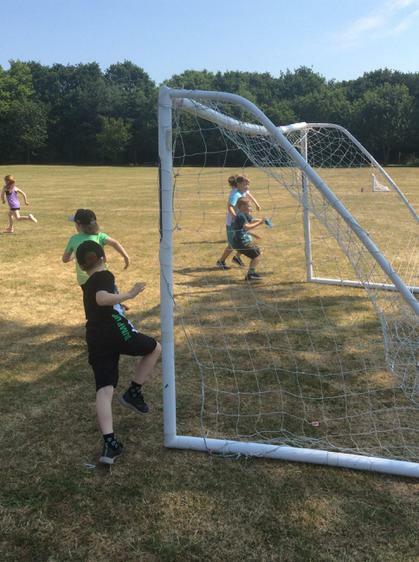 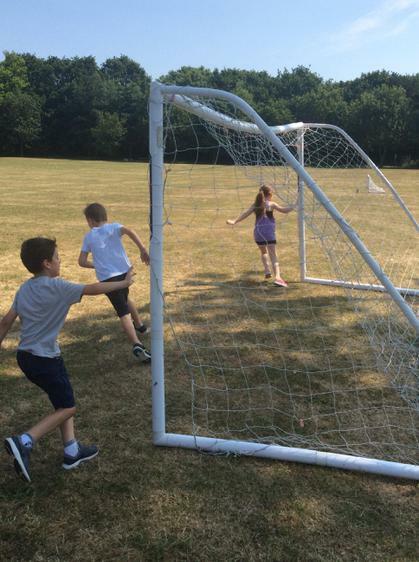 Year 2 went onto the school field to reenact the Temptations of Christ - lots of shouting NO!